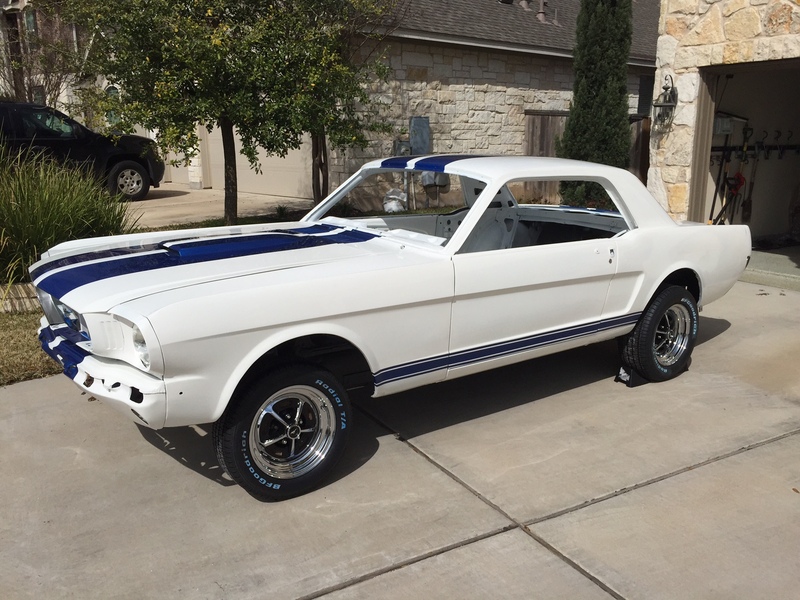 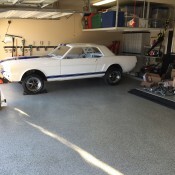 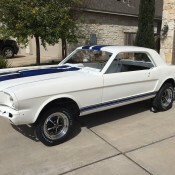 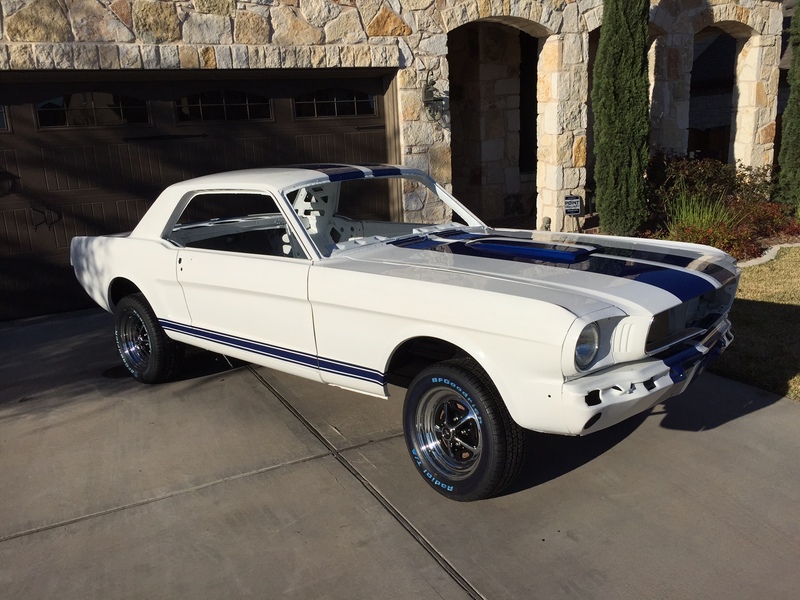 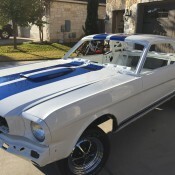 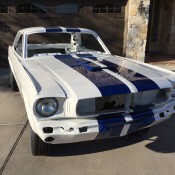 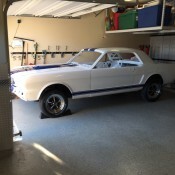 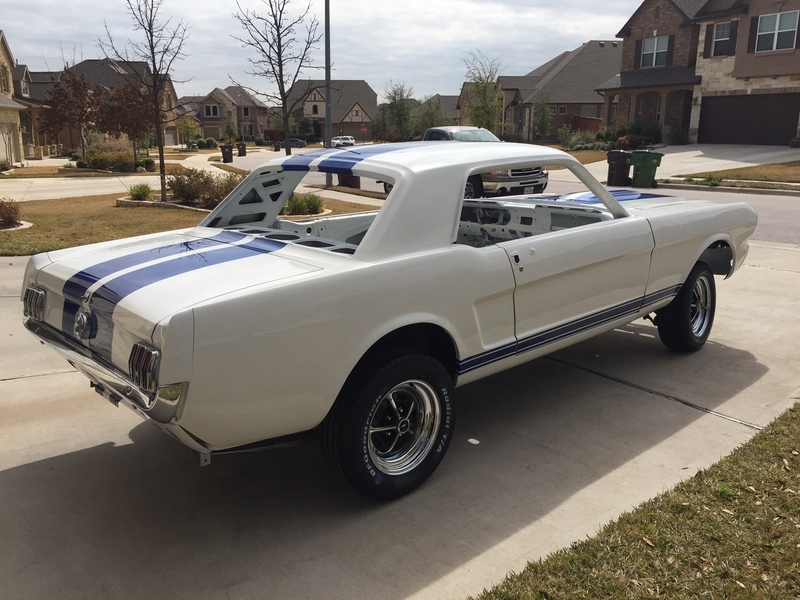 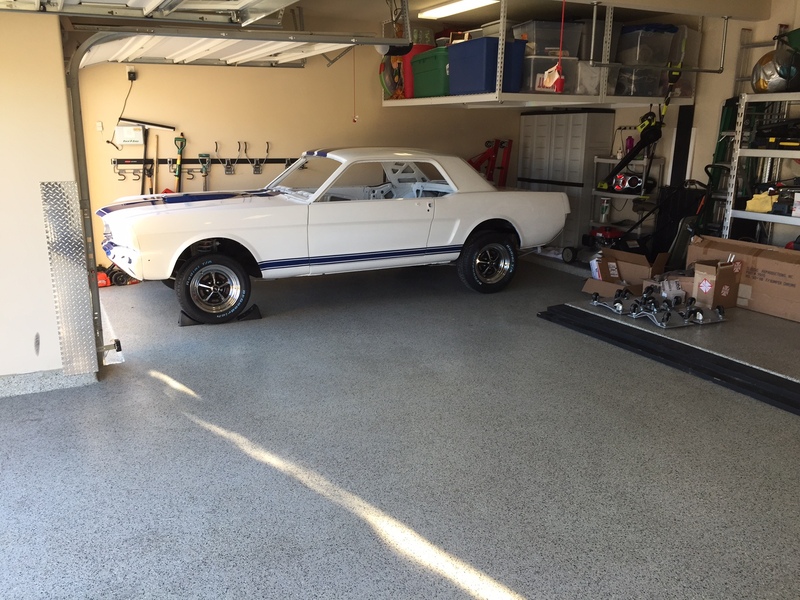 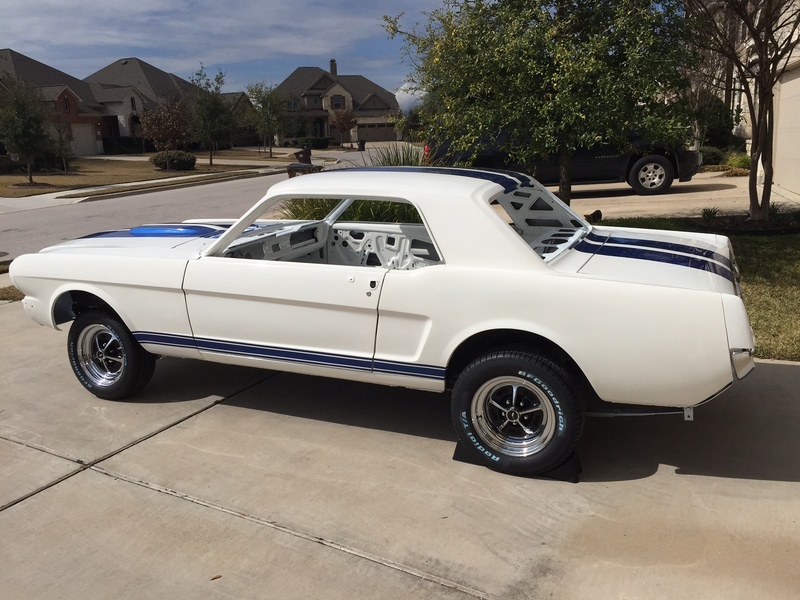 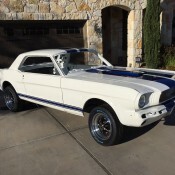 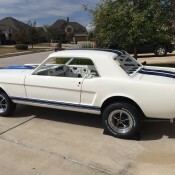 The Mustang is Back Home! 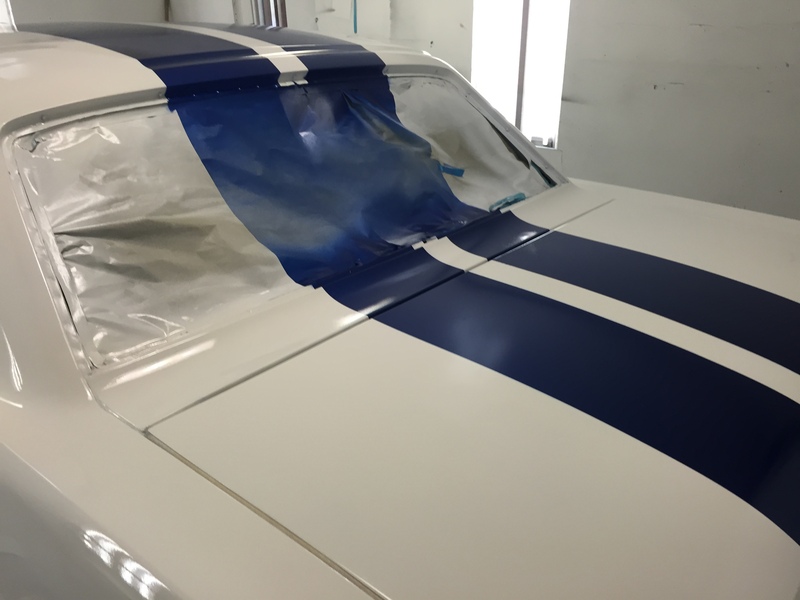 The car is back from the painters and back at home! 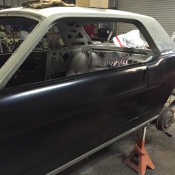 It is stiiting tall since there is no motor. 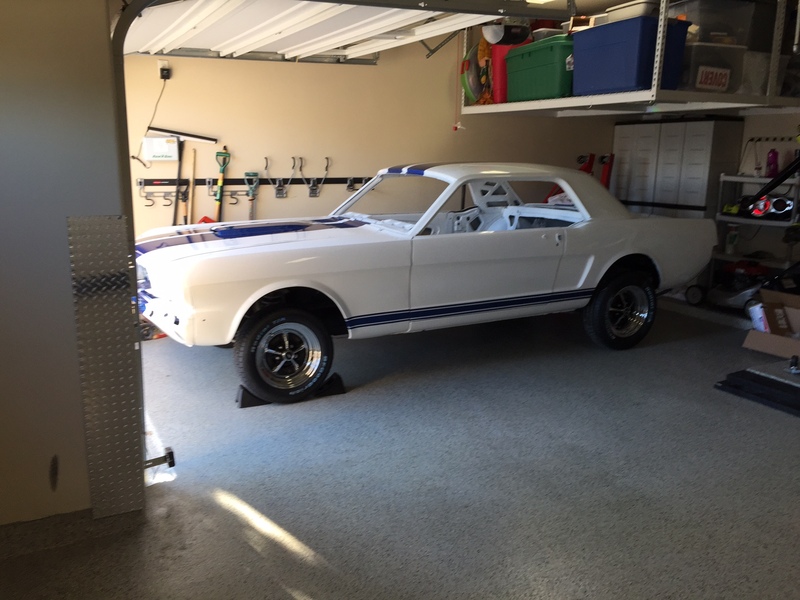 I already installed the tires and wheels so she sits pretty. 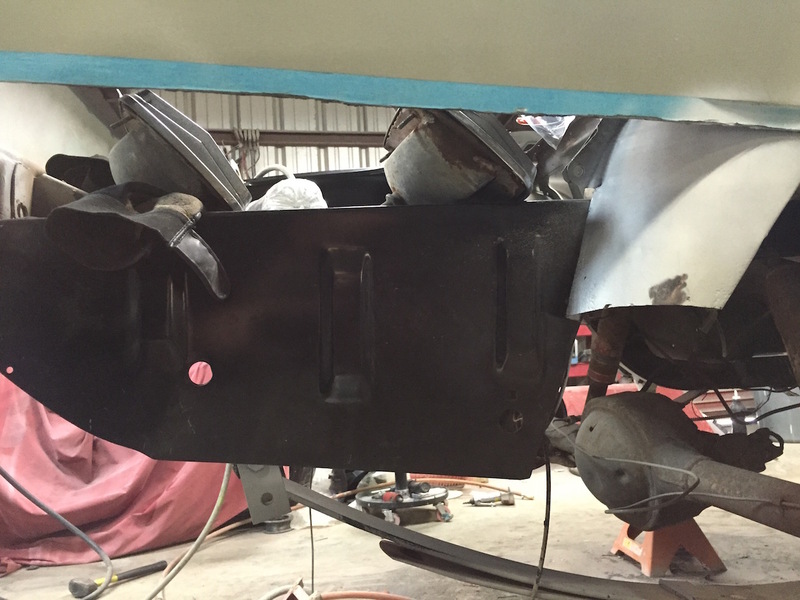 I also installed the gas tank, the filler hose, the gas cap, the tail lights, and the head lights. 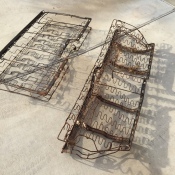 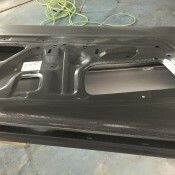 I started to install the grille and trip, but they sent me the wrong driver’s side grill trip, and I need the hood latch to come in because the grille mounts to it. 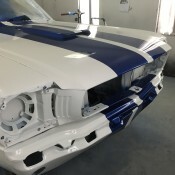 I still need to finish installing the grille and bumpers… then this phase is complete. 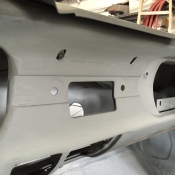 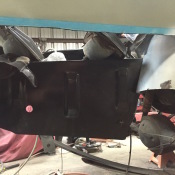 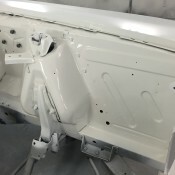 Other than some clean up items… install new hood hinges and bolts, the hood latch. 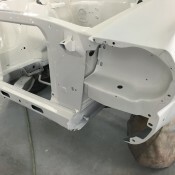 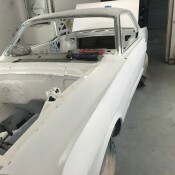 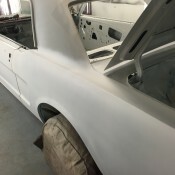 The wheel wells have been sprayed with bedliner spray, the frame and underside of the car painted, and the dash and inetrior prepped for paint. 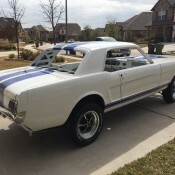 I should be able to pick up the car next week. 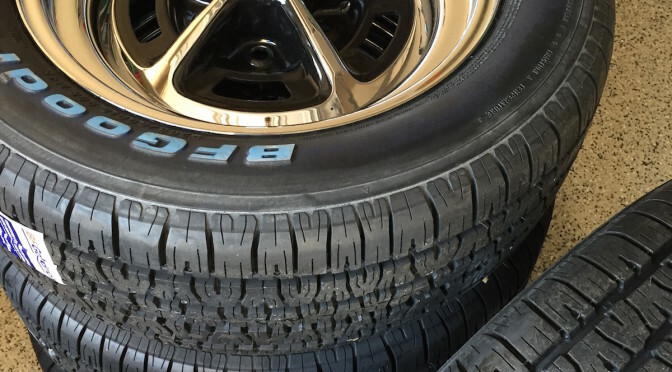 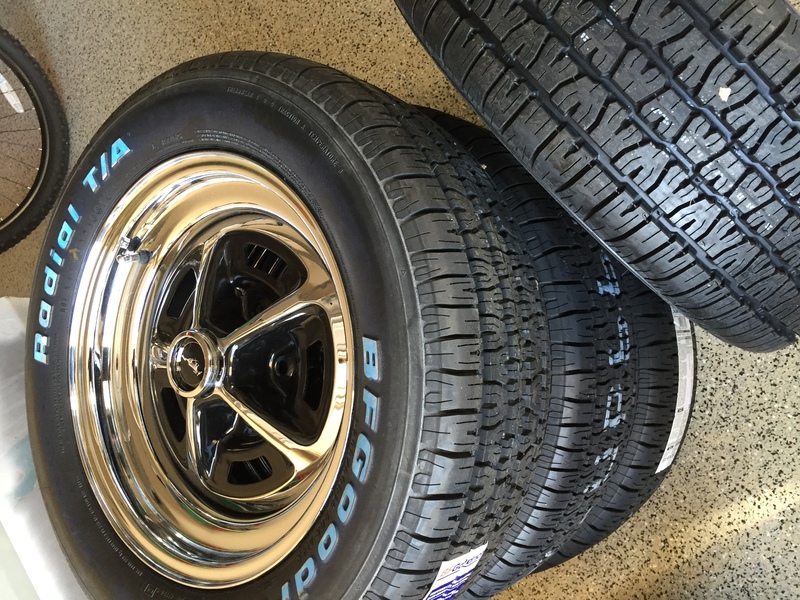 And that is perfect timing, as the tires and wheels arrived today. 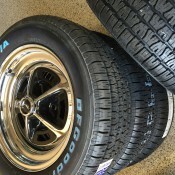 “The girl’s got new shoes to wear! 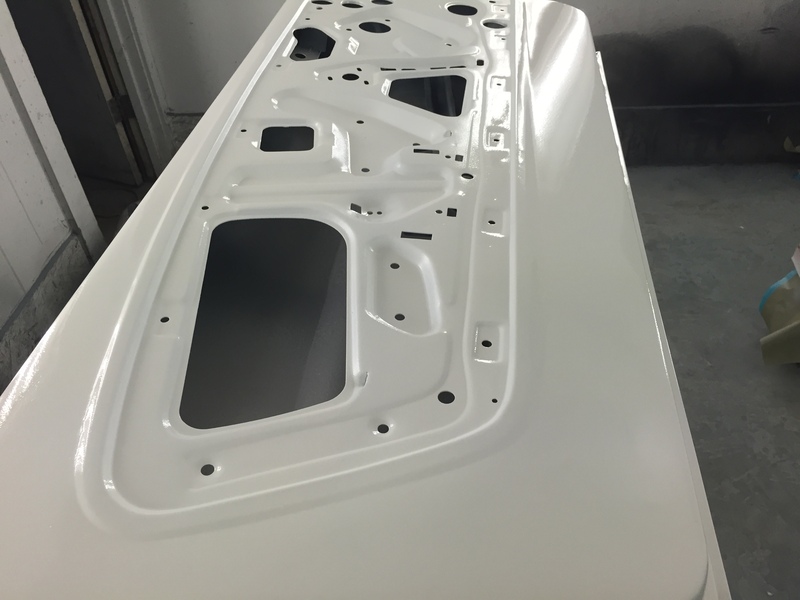 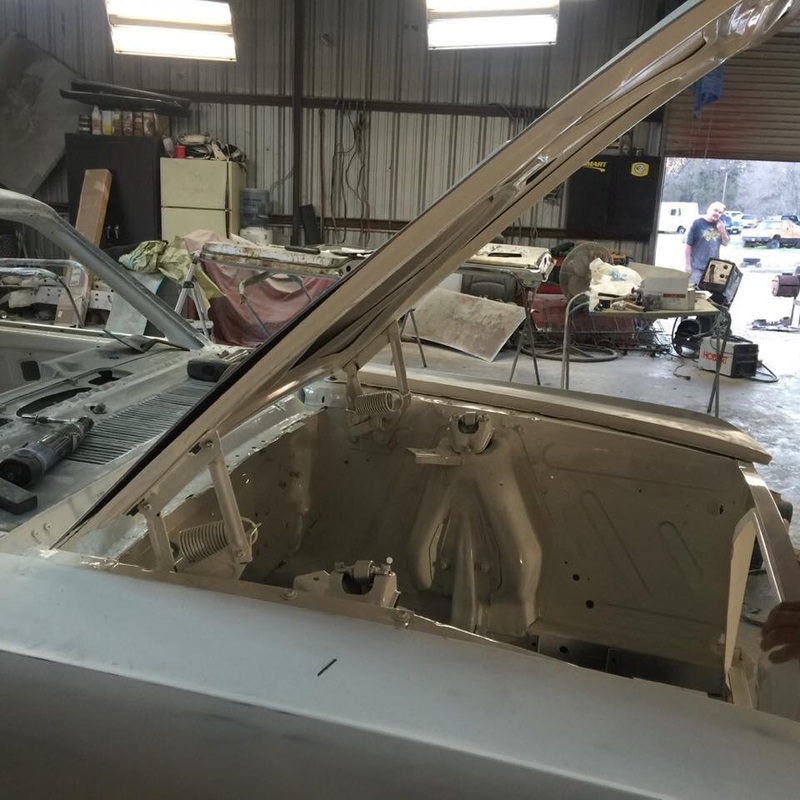 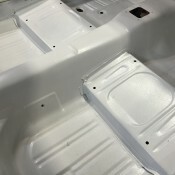 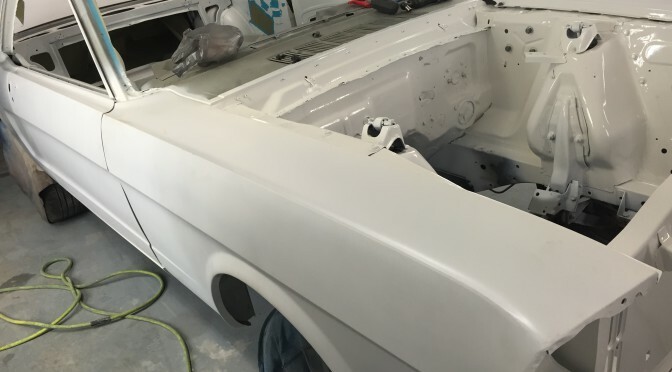 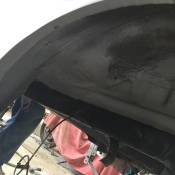 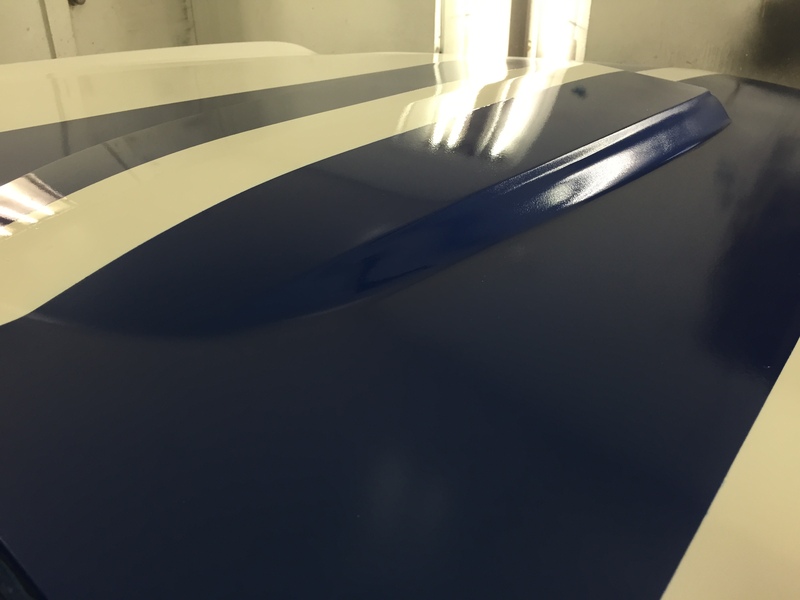 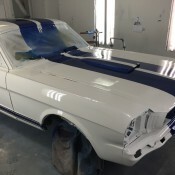 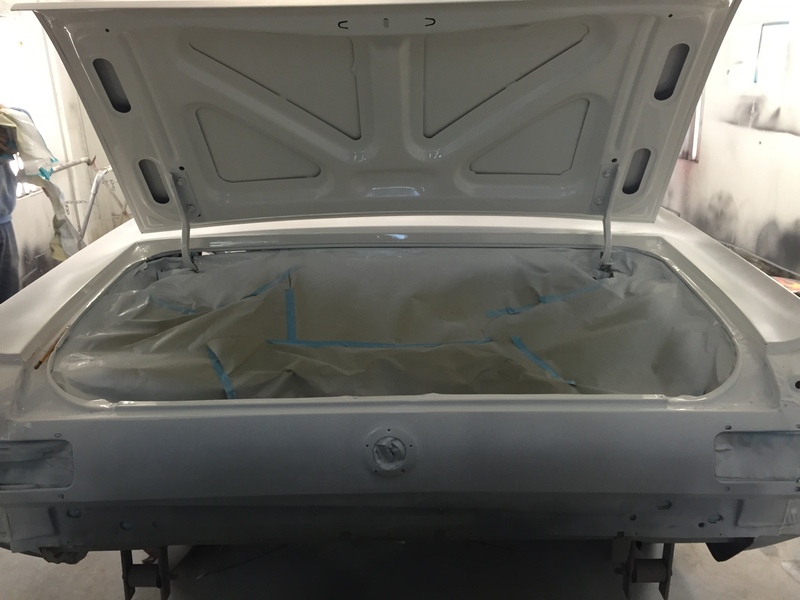 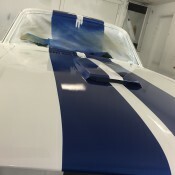 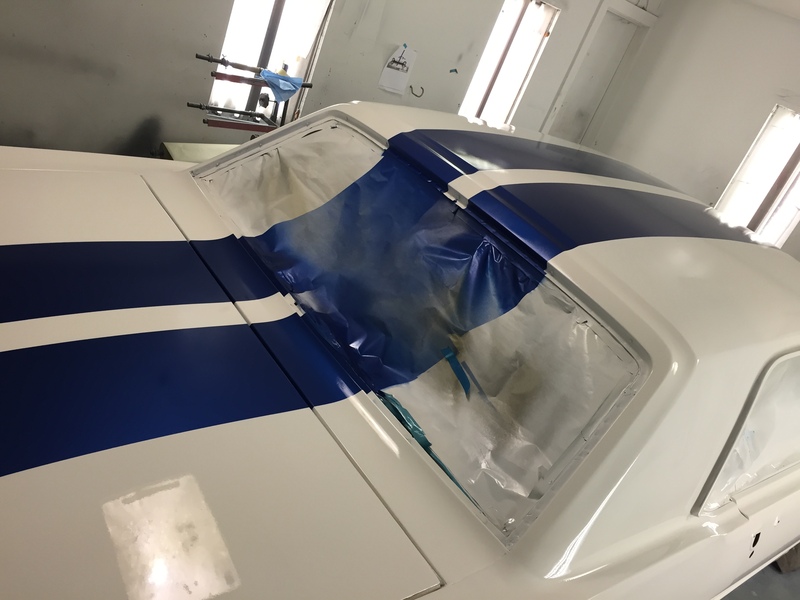 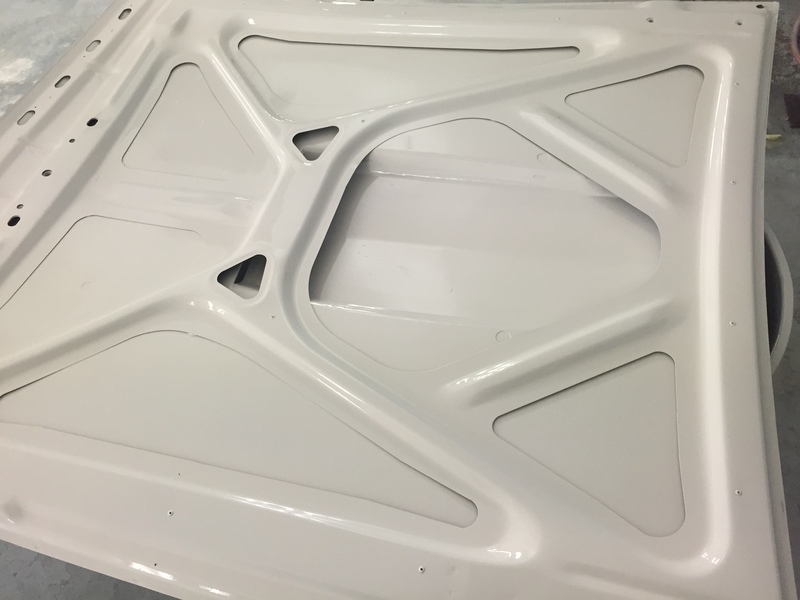 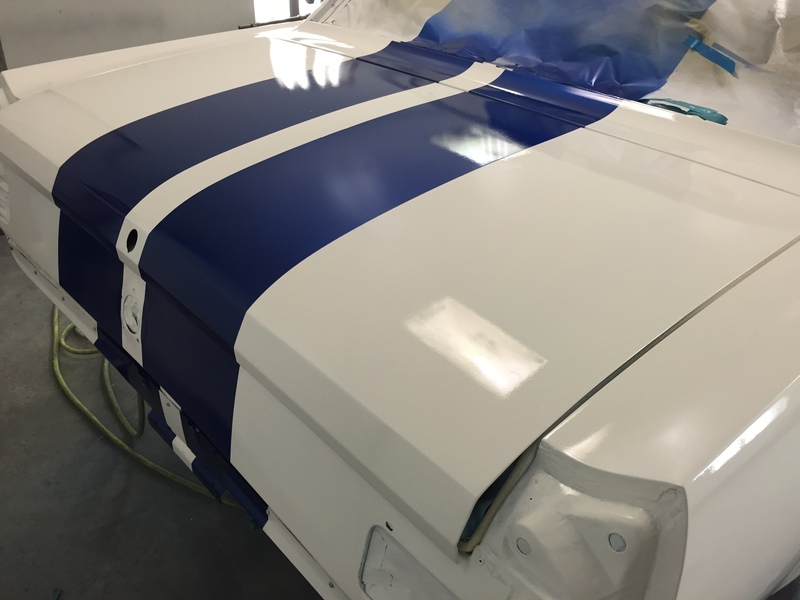 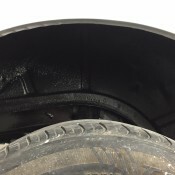 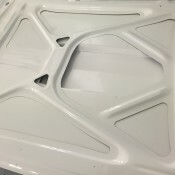 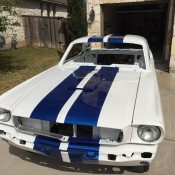 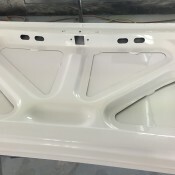 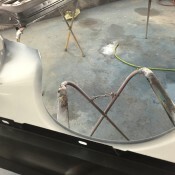 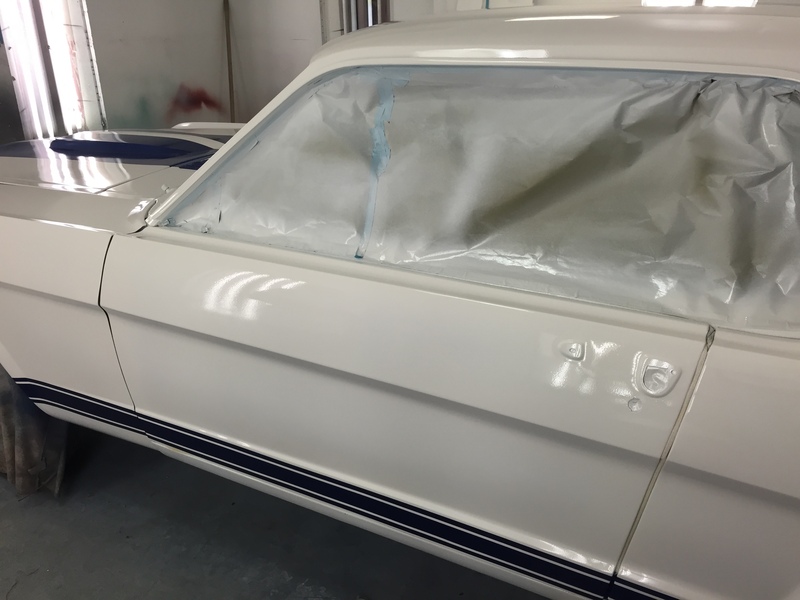 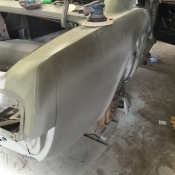 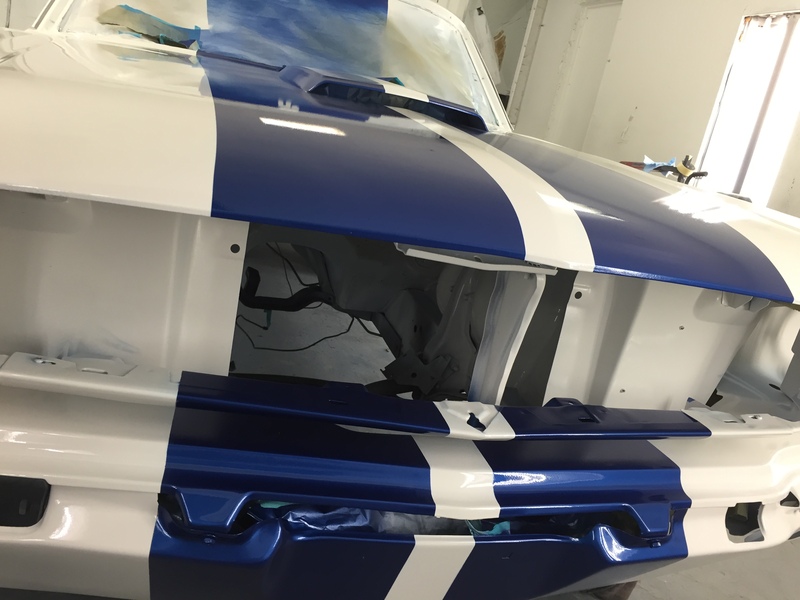 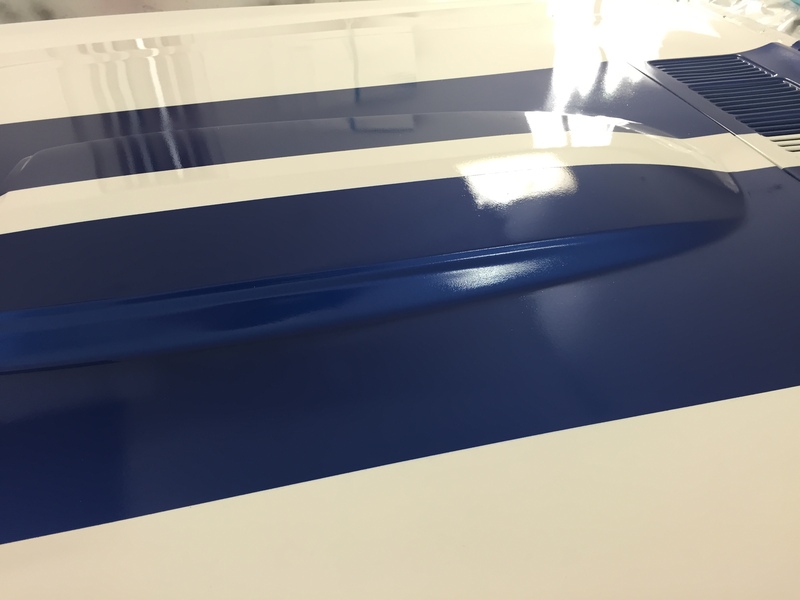 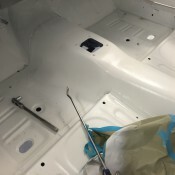 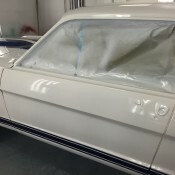 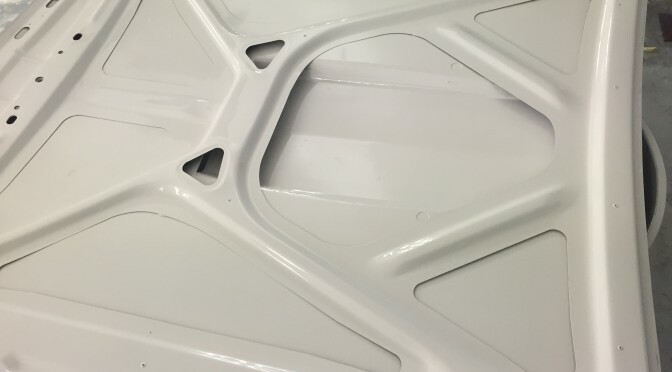 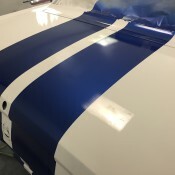 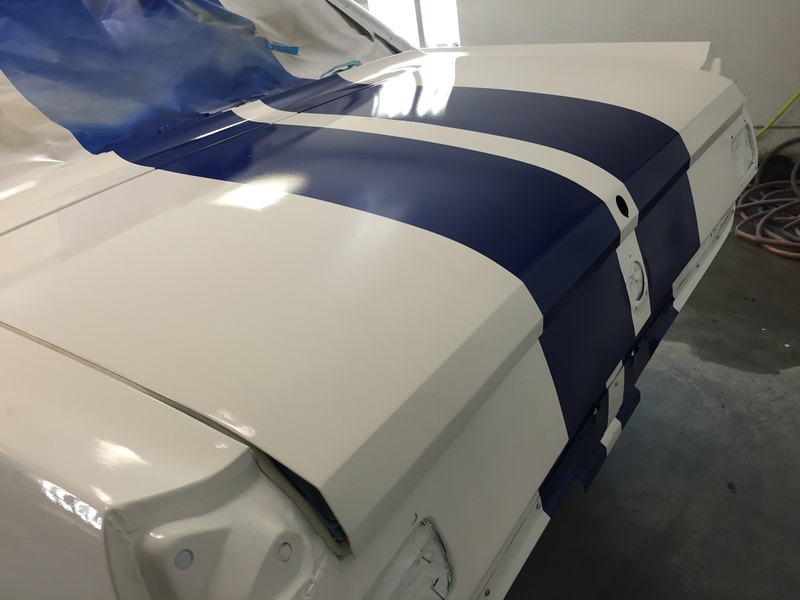 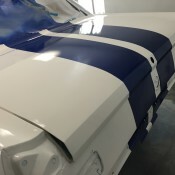 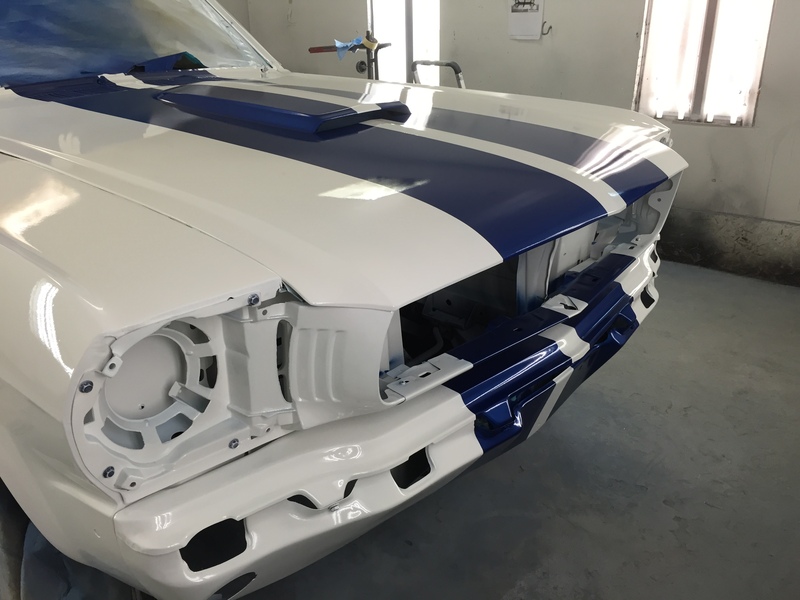 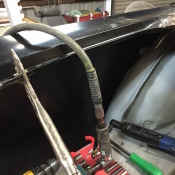 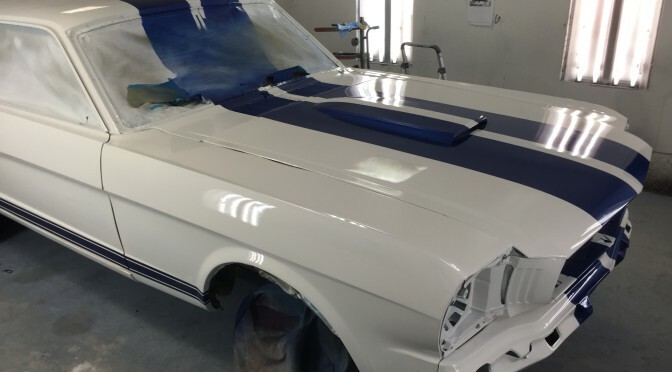 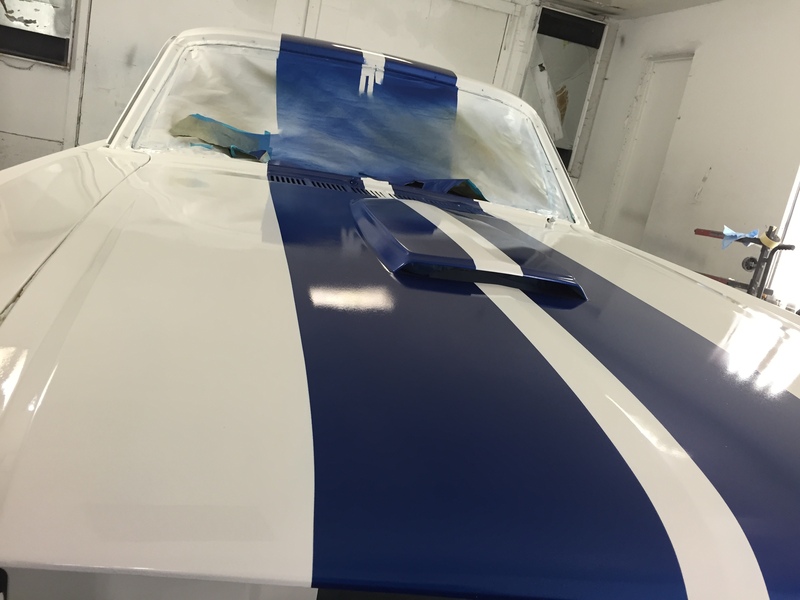 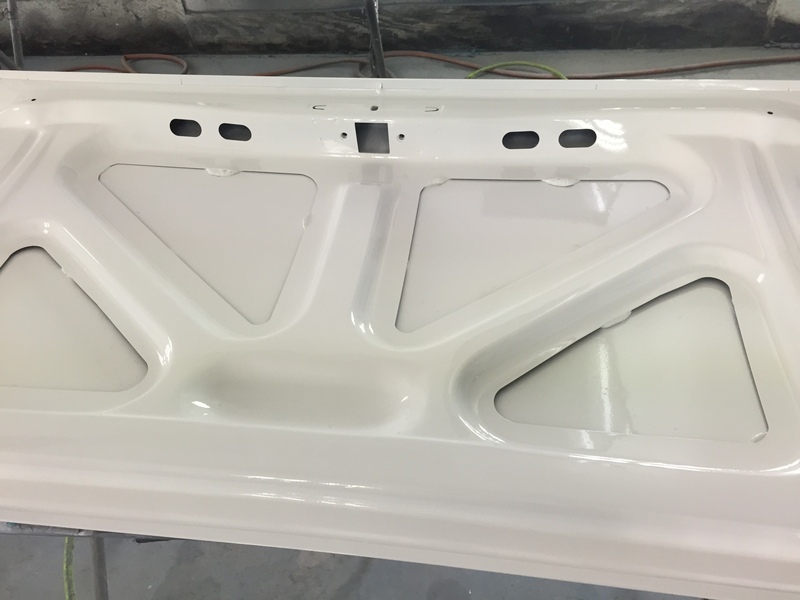 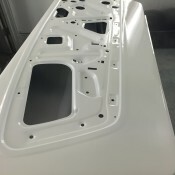 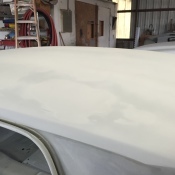 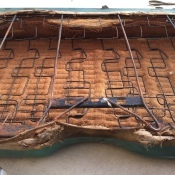 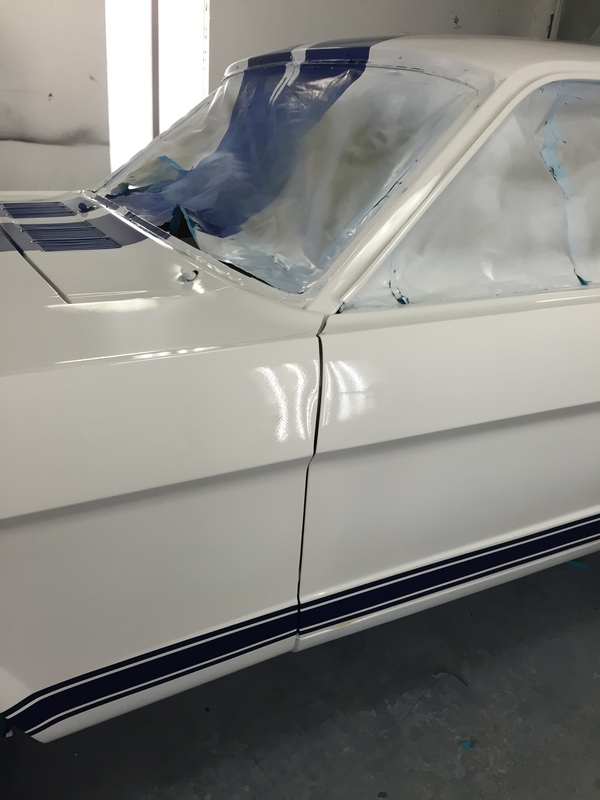 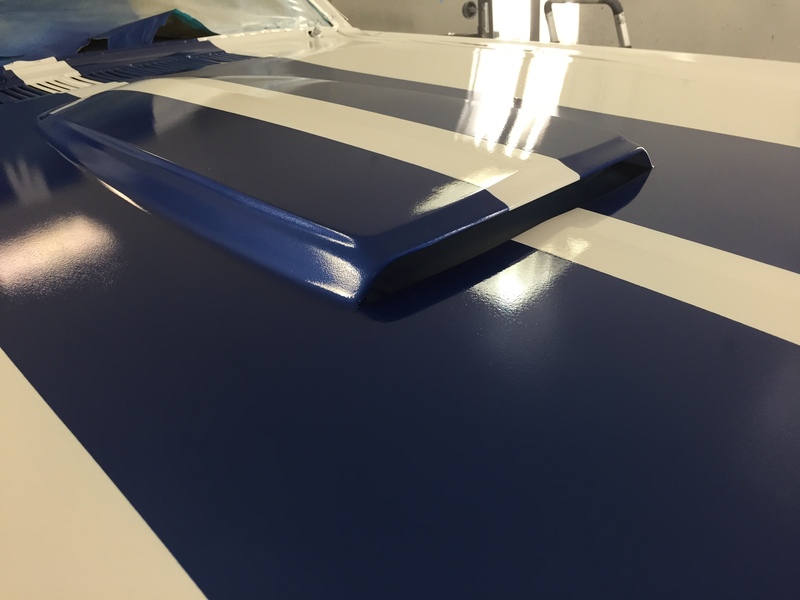 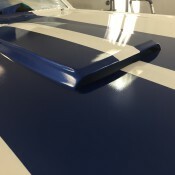 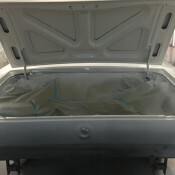 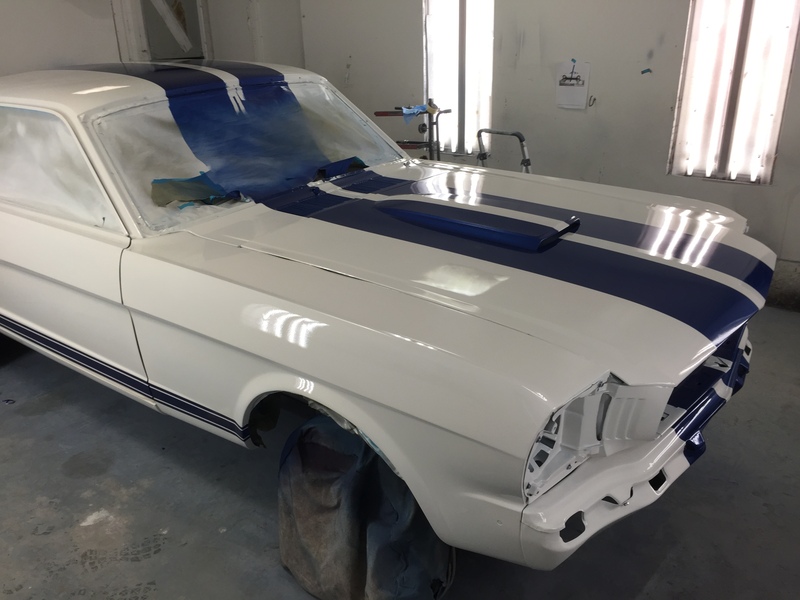 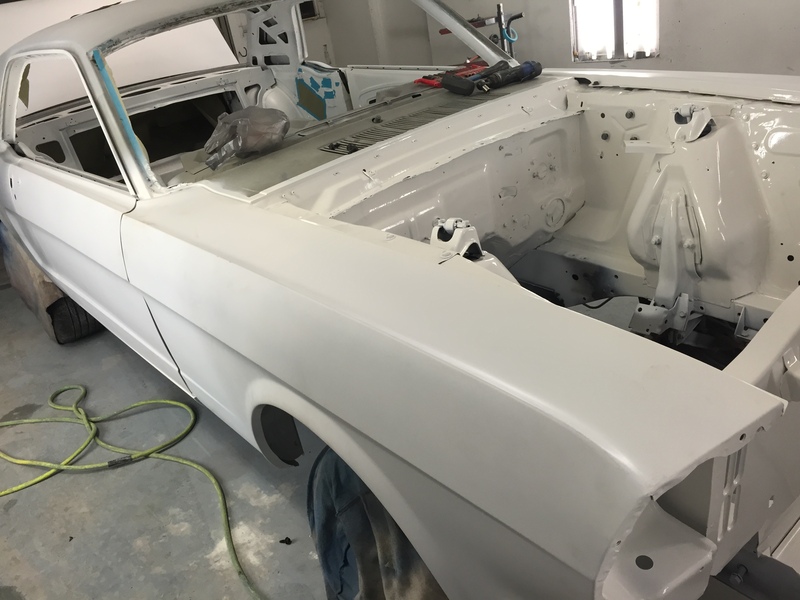 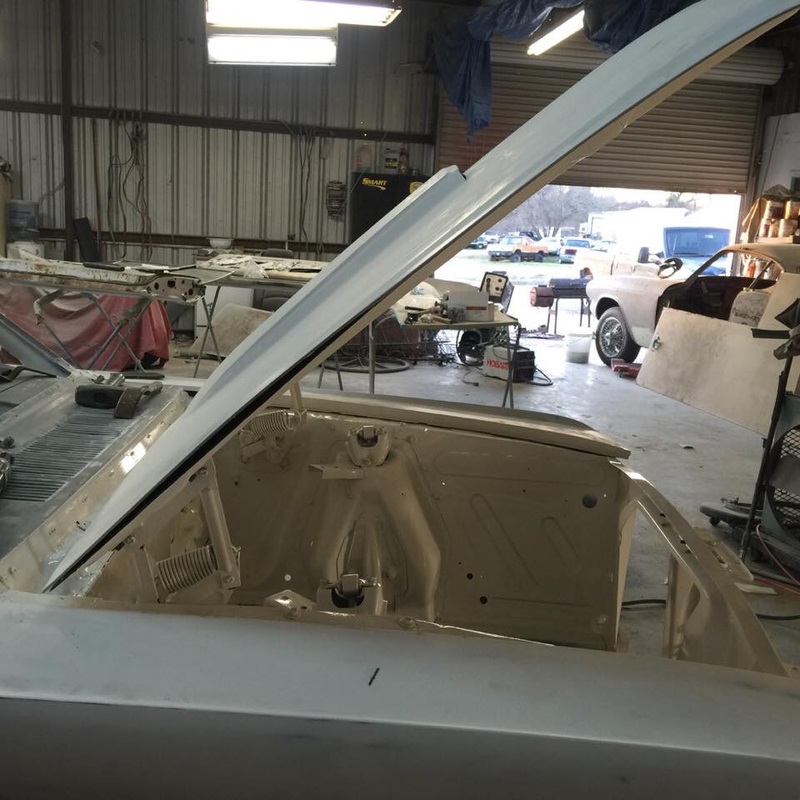 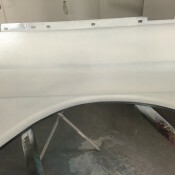 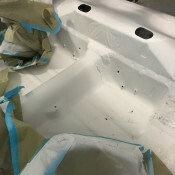 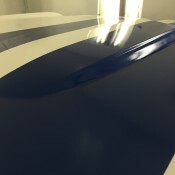 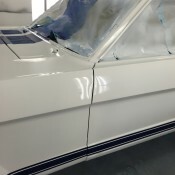 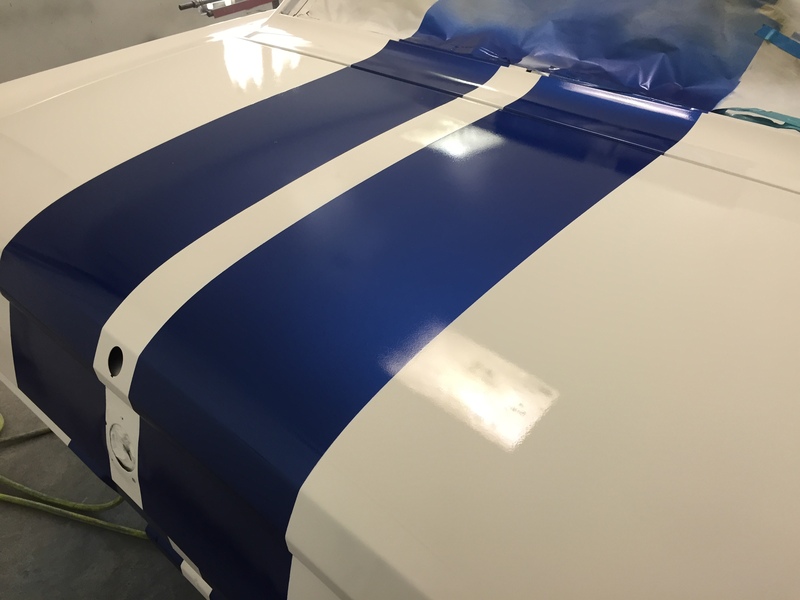 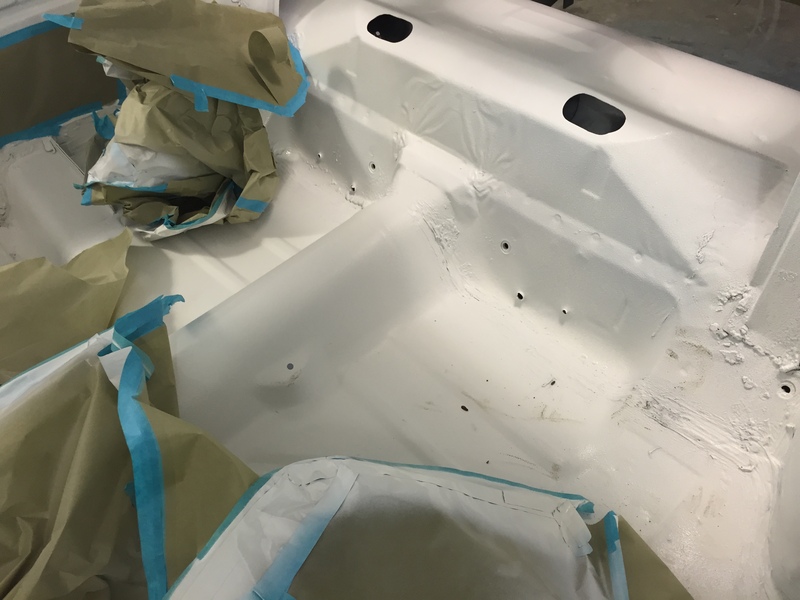 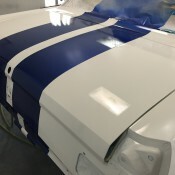 After 40 hours of body work on the hood, we mounted it to the hinges and tried to close the hood to check the gaps, and with only a small amount of pressure, we heard a “crack” sound and the rear of the hood frame began to separate from the fiberglass. 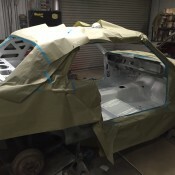 So now what? 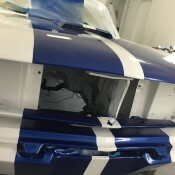 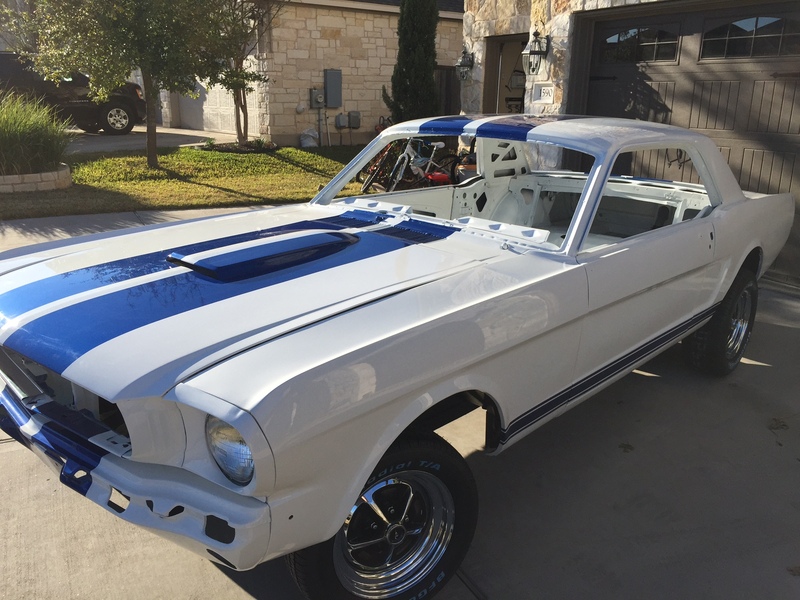 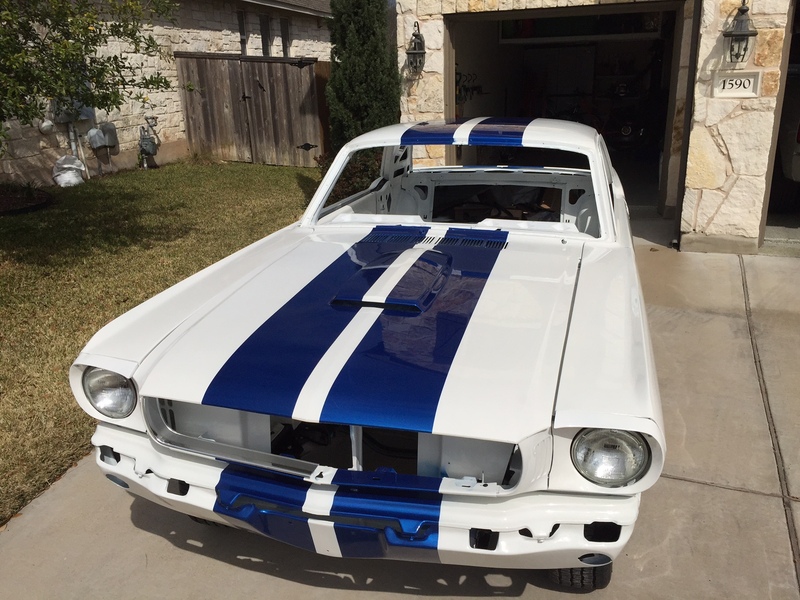 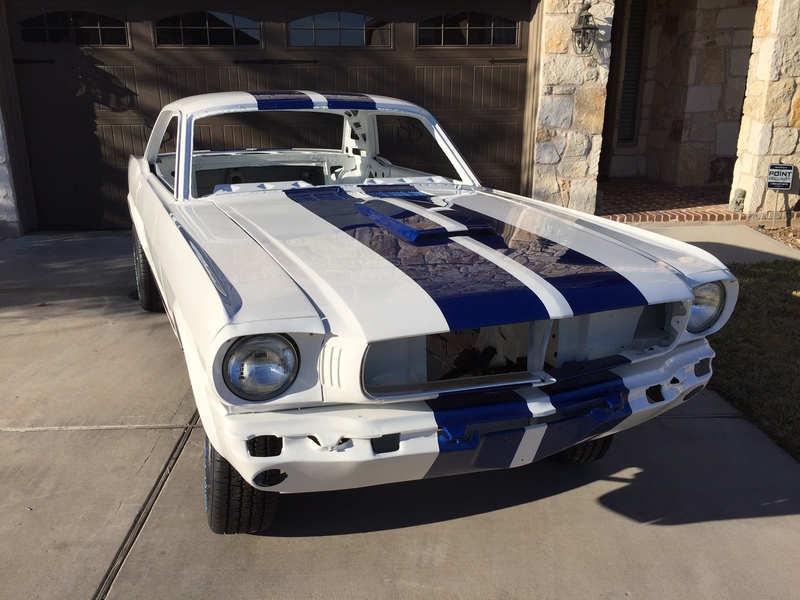 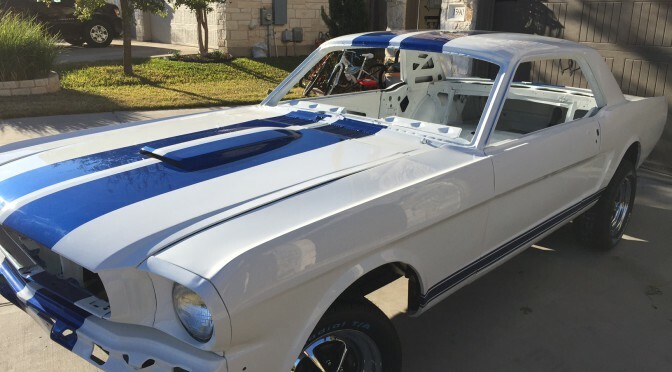 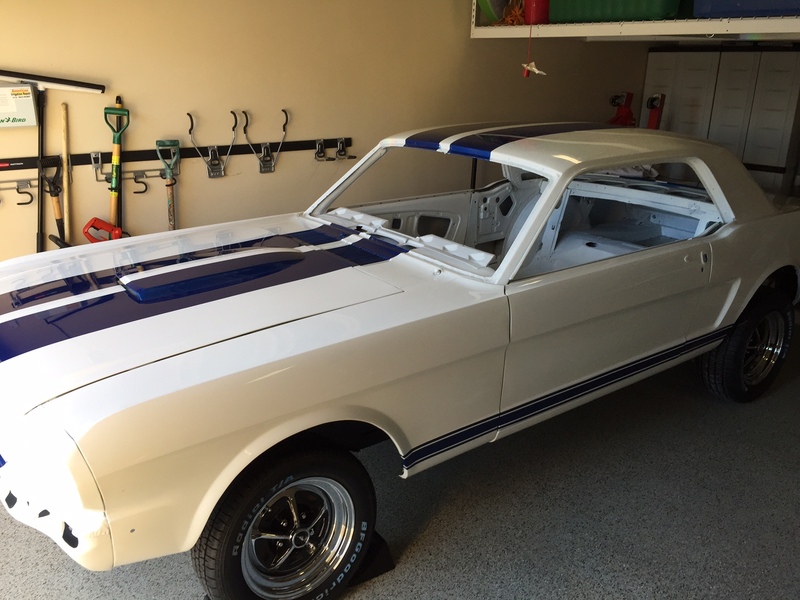 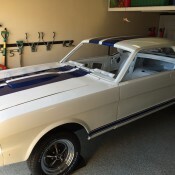 Return the hood for a new one and spend another 40 hours of body work on the new hood? 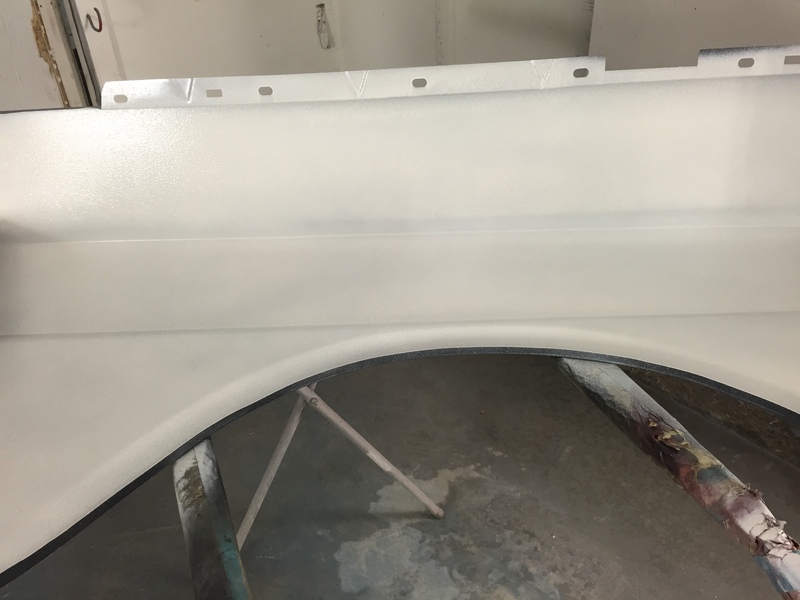 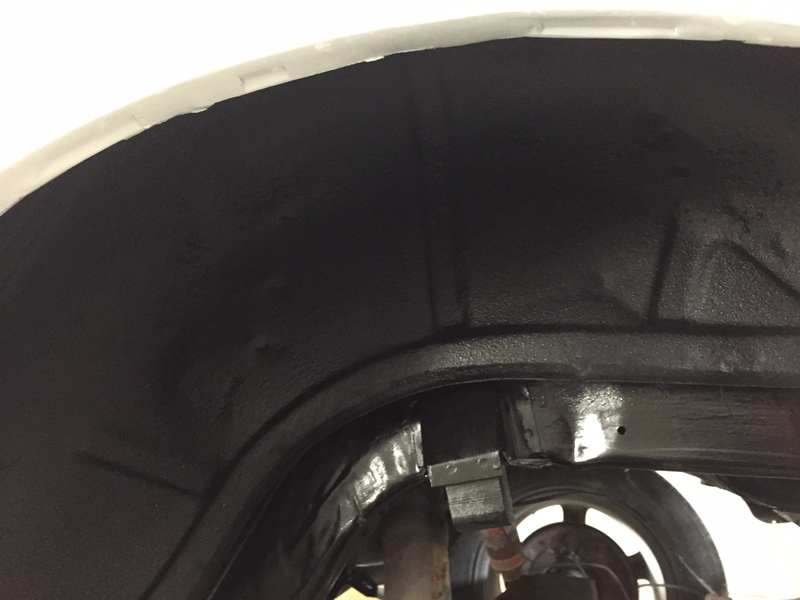 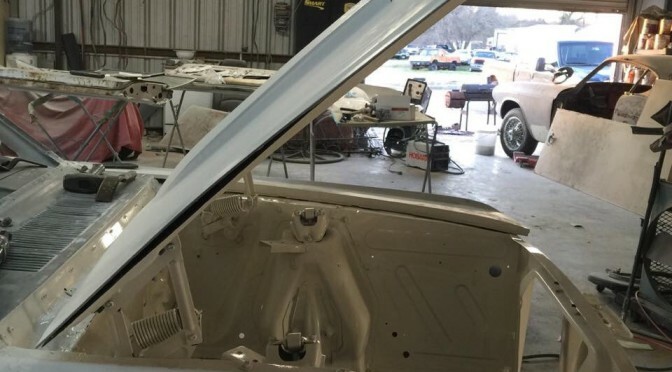 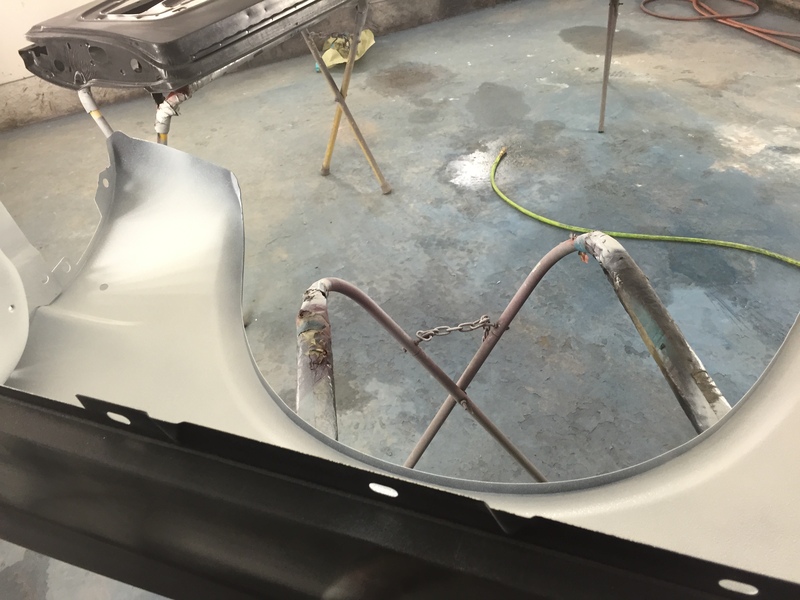 Try and get a refund and buy a metal hood and cut it out and bond on a fiberglass scoop? 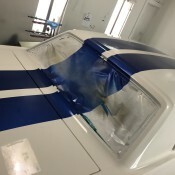 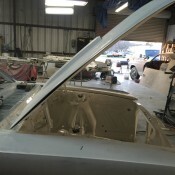 For now we will try re-bonding the metal frame to the fiberglass hood. 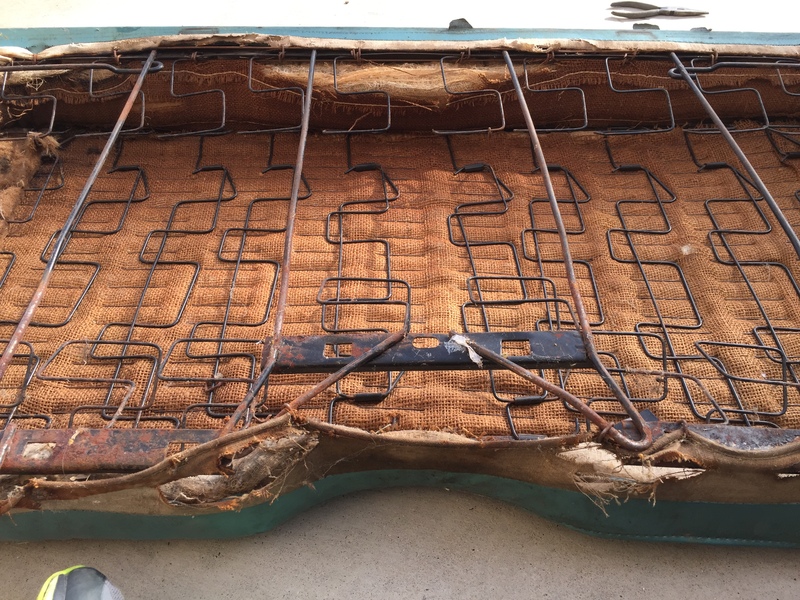 It must have been improperly bonded from the factory to separate so easily. 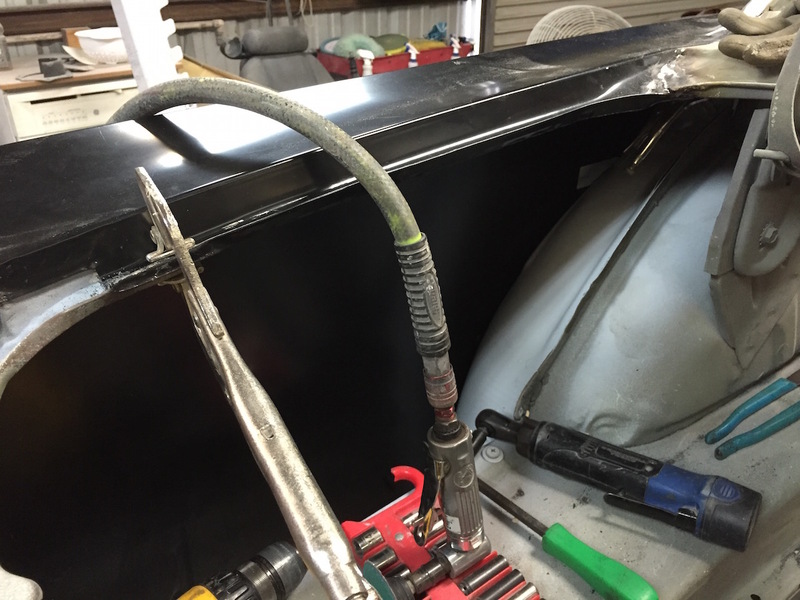 Hopefully that will do the trick. 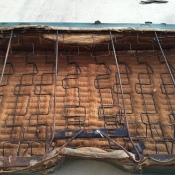 I also think it may be a good idea to remove the hood hinge springs or torch them to losen the springs significantly. 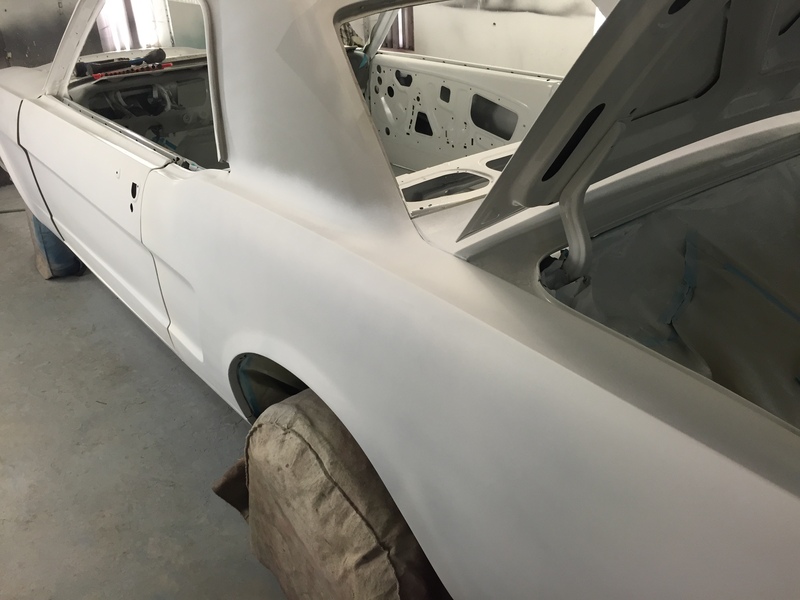 We are about a week from a finished paint job! 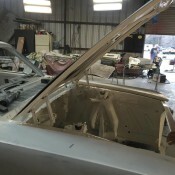 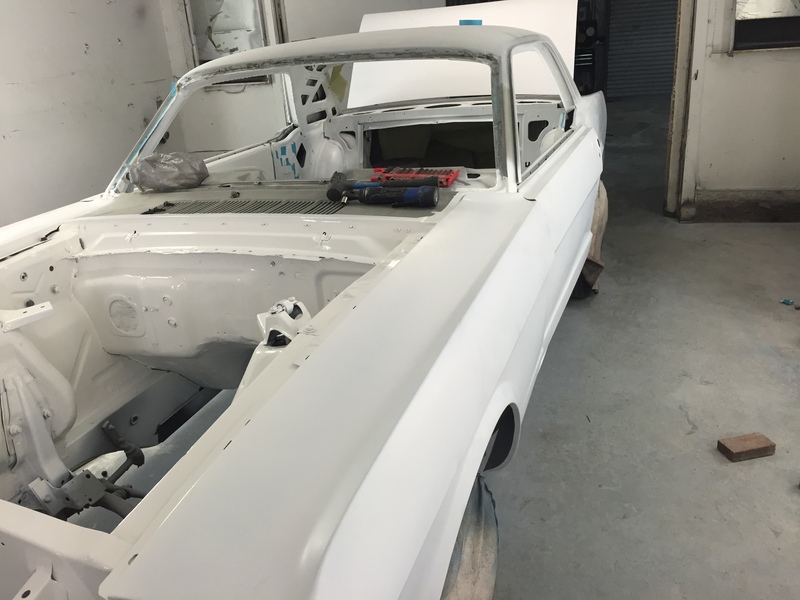 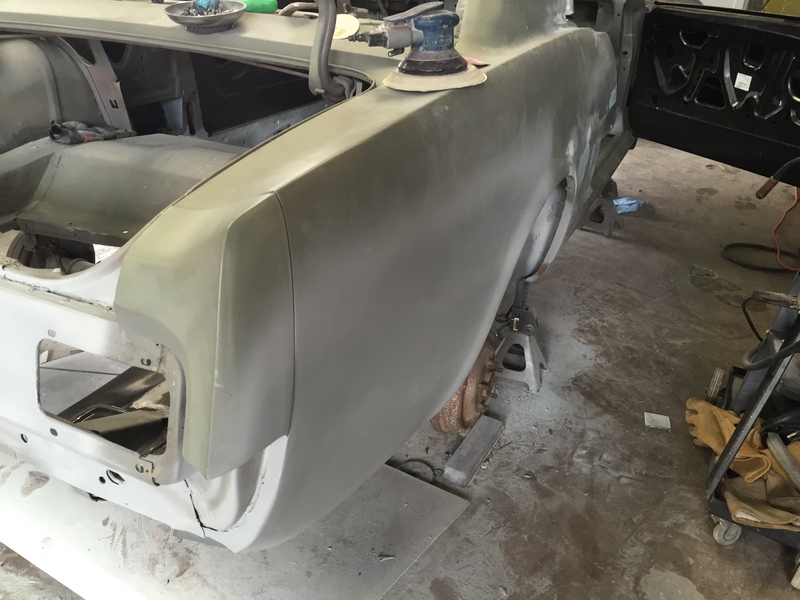 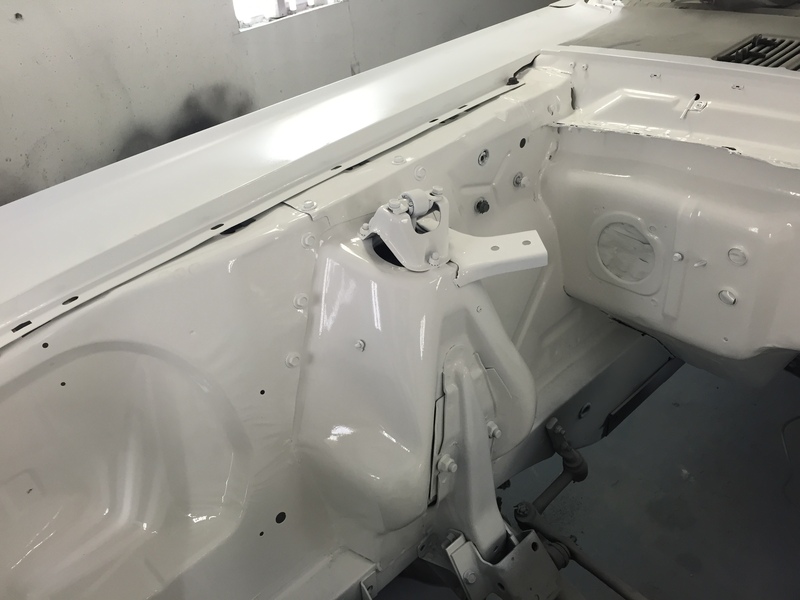 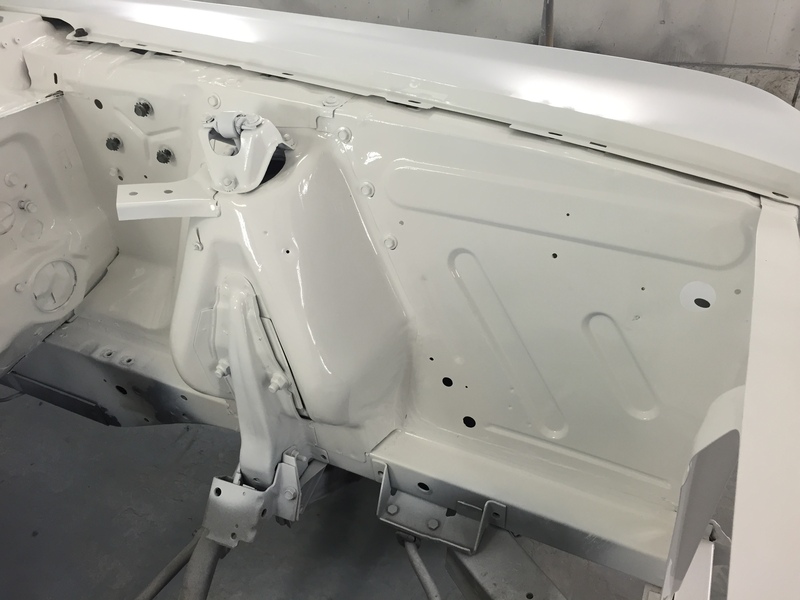 Radio fixed, roof blocked, priming for paint this week! 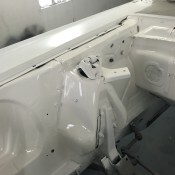 The radio area was repaired. 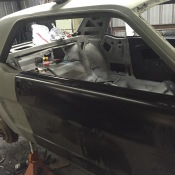 The old, mangled dash piece was cut out and the fresh metal welded in. 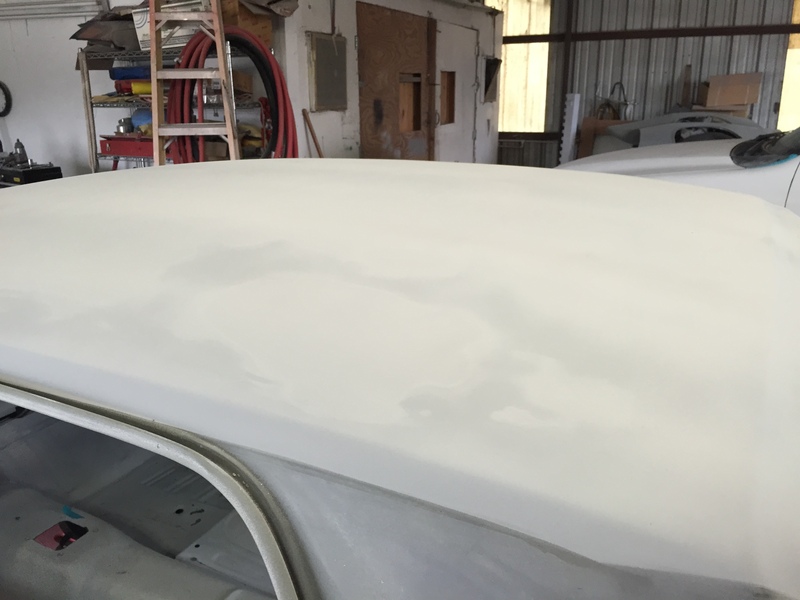 The roof was primed, blocked, and sanded. 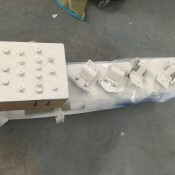 And repeated a few times. 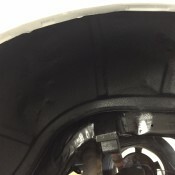 Rear end too. 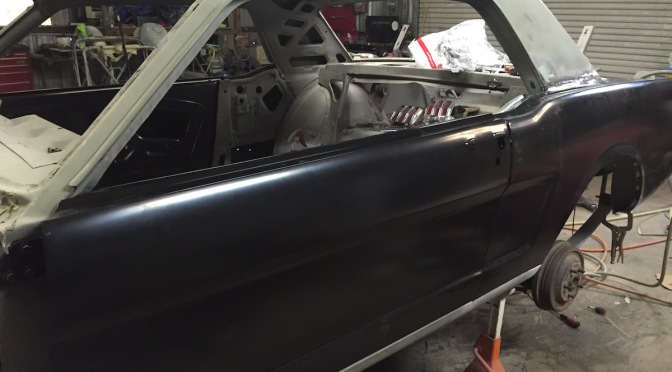 Welding up the holes for the trim under the door and in the quarter panels. 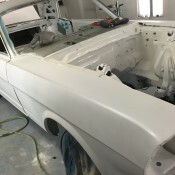 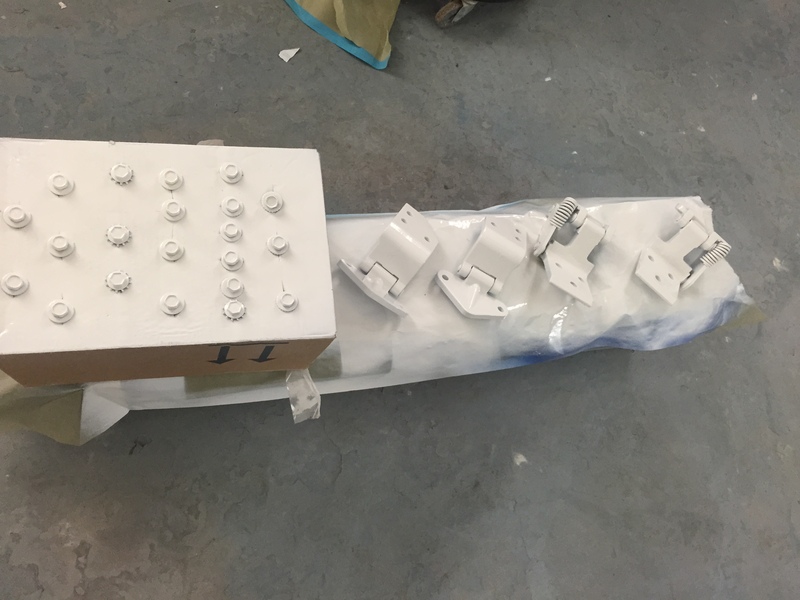 And we should be ready for paint next week!! 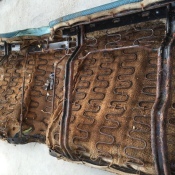 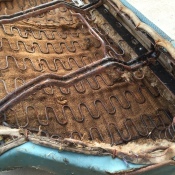 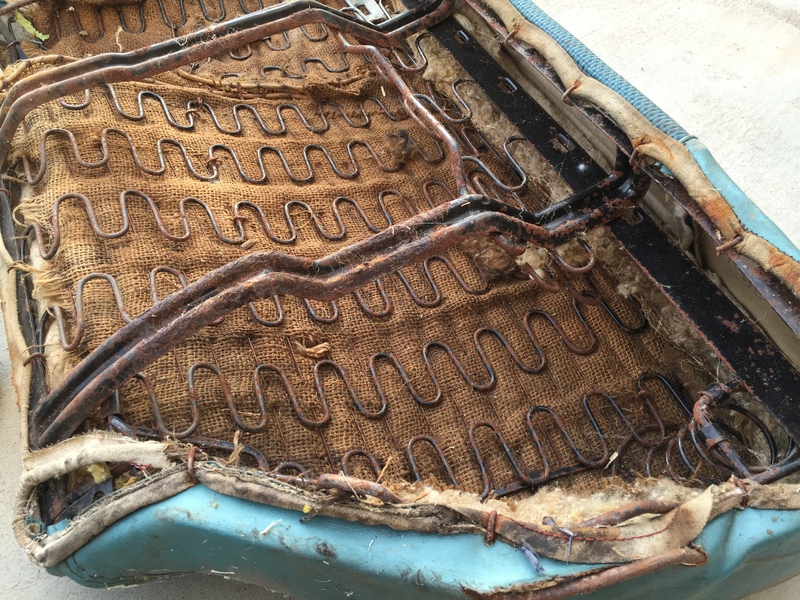 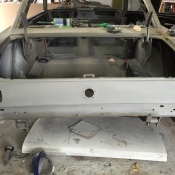 Today I took on what I thought would be the easy task of removing the seat upholstery from the rear seat frames so I can get the frames blasted and painted. 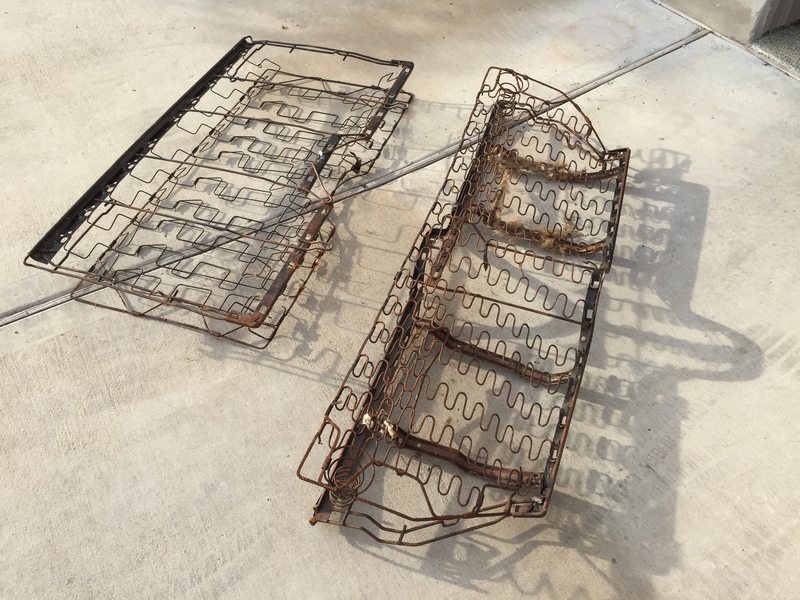 I had no idea how long it took to get all the stupid little hog rings off and strip down the frames. 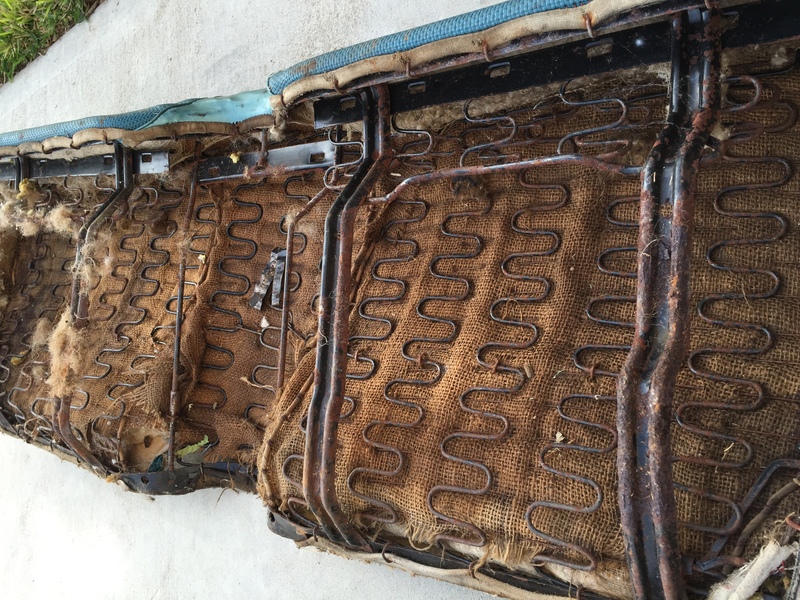 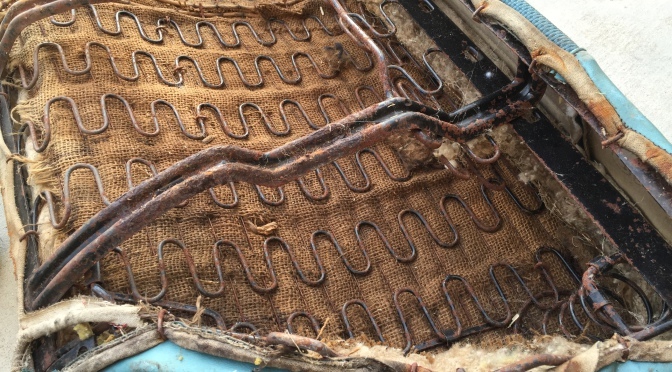 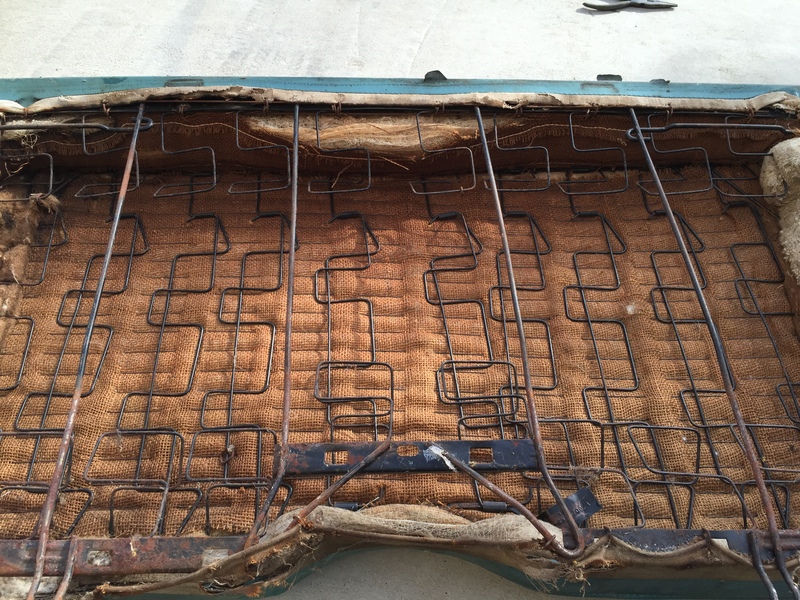 When I order a new upholstery kit, I am taking the frames and kit to Austin-Interiors and let the experts handle it!! 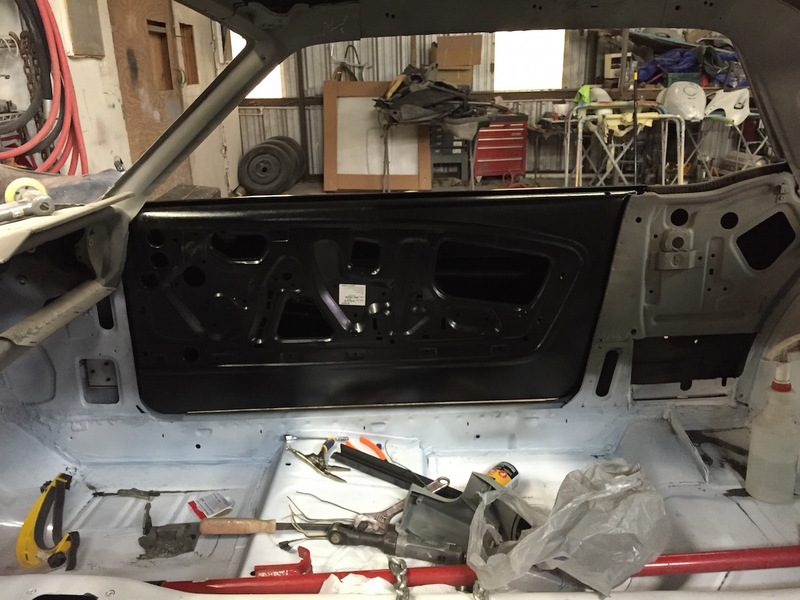 We have the doors hung and we are working the gaps now. 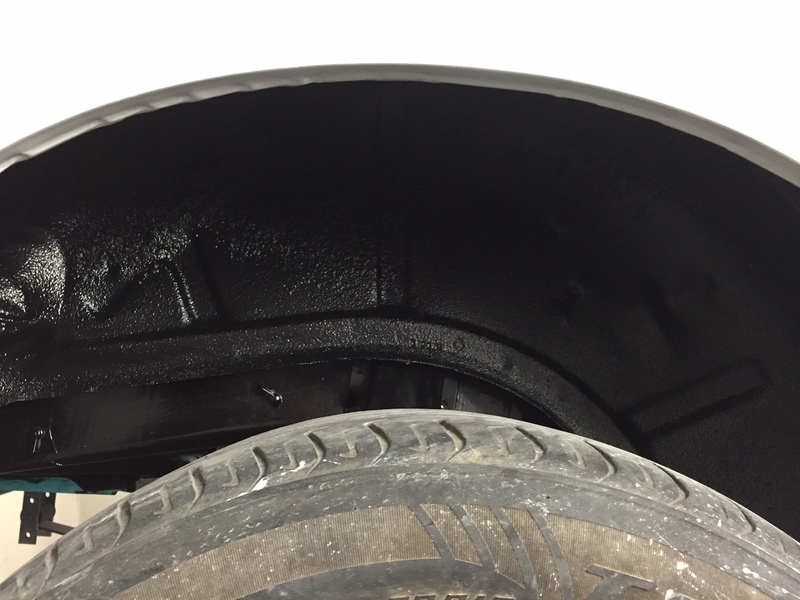 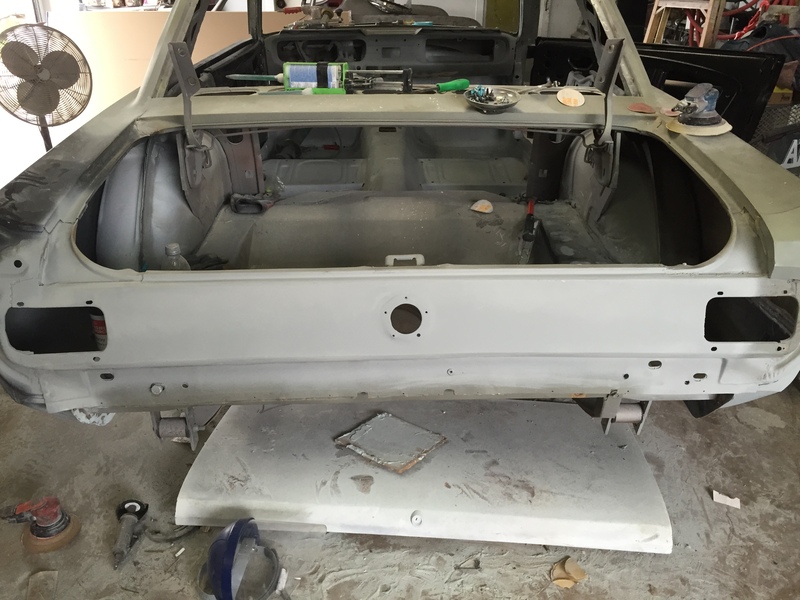 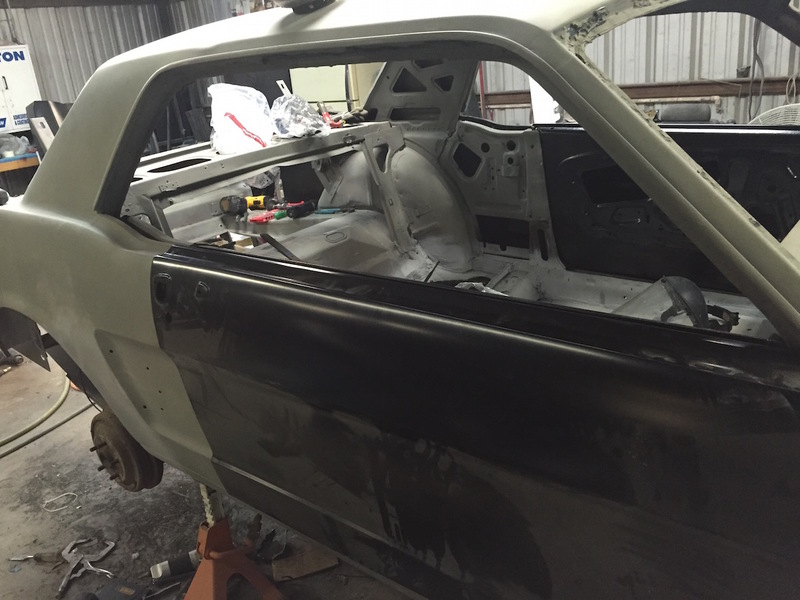 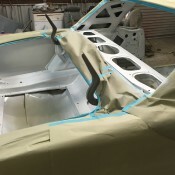 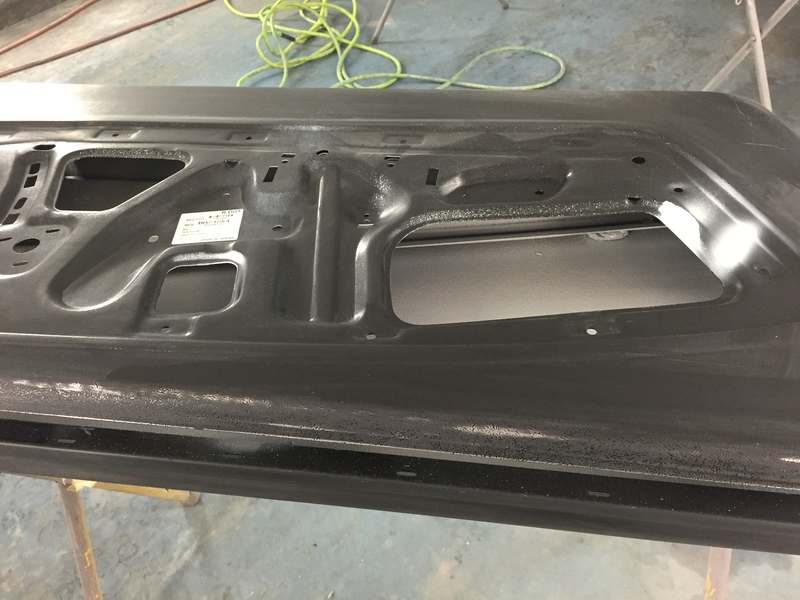 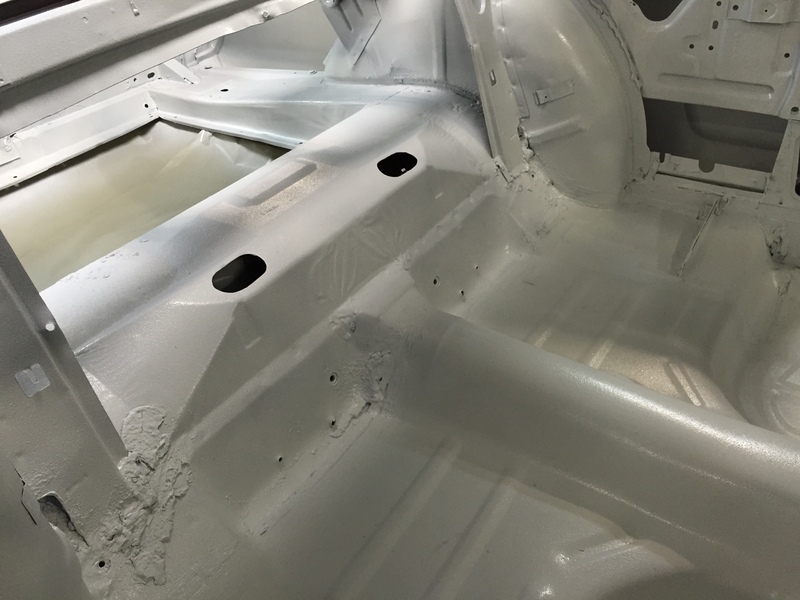 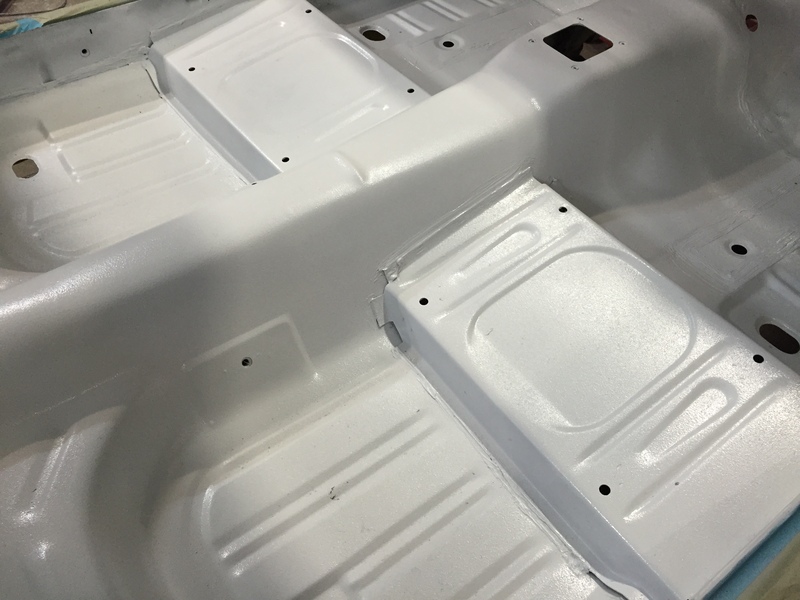 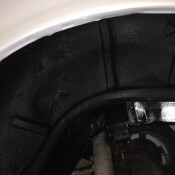 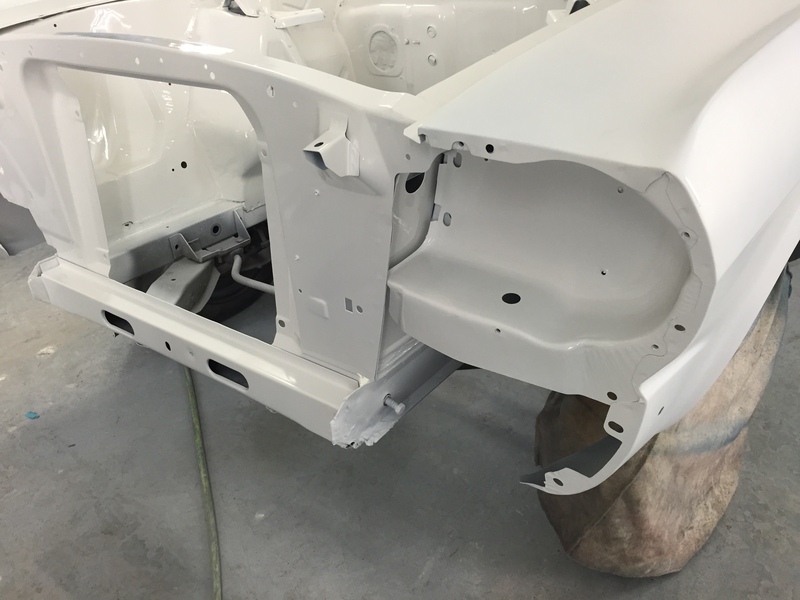 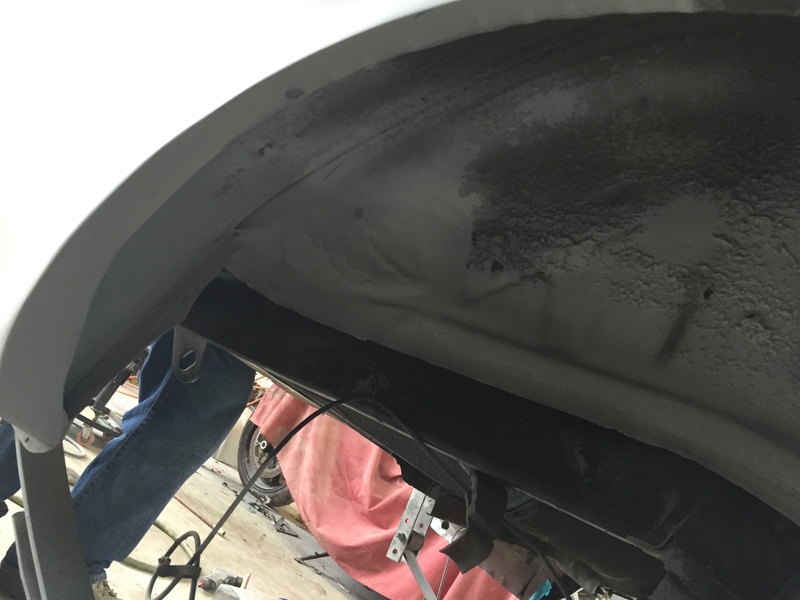 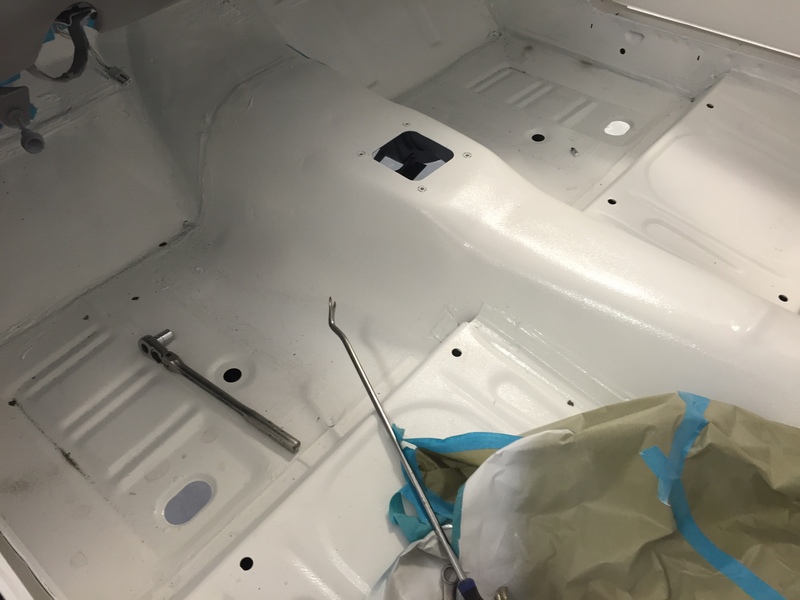 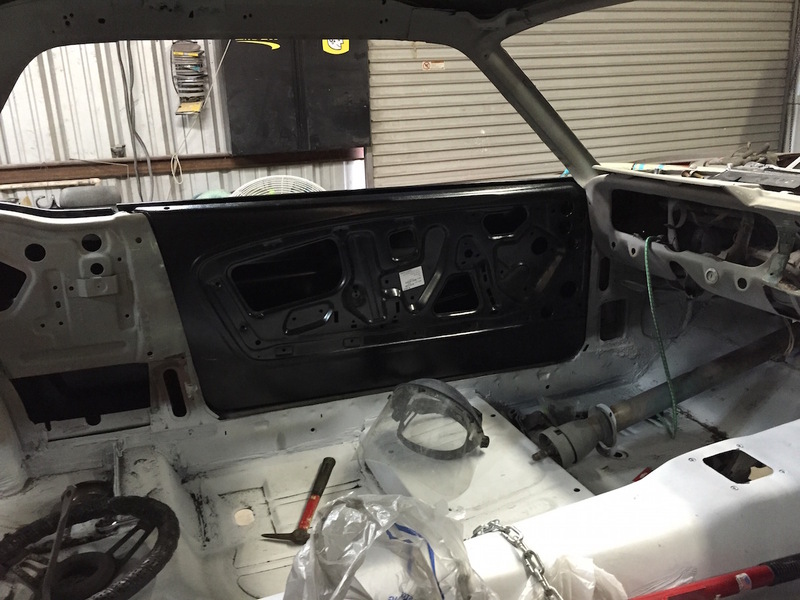 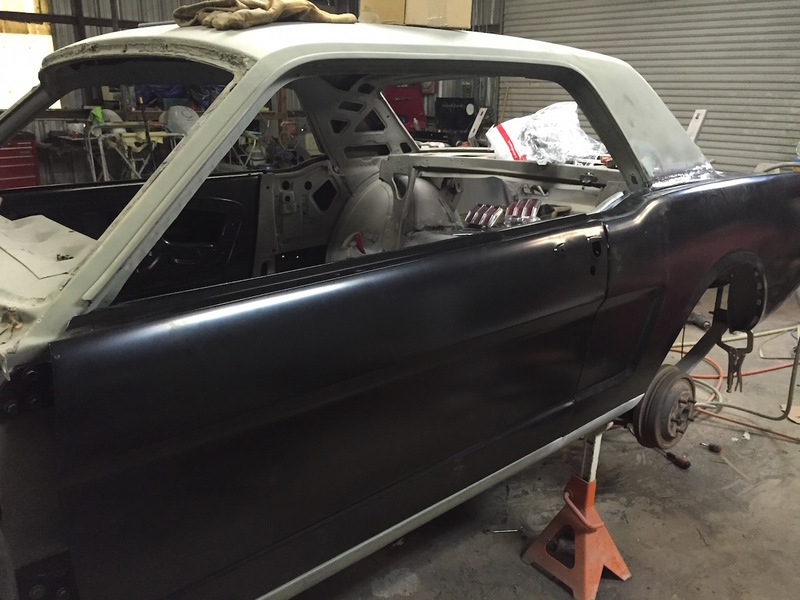 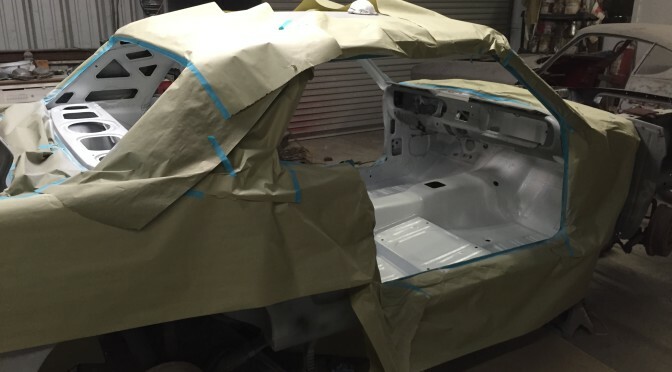 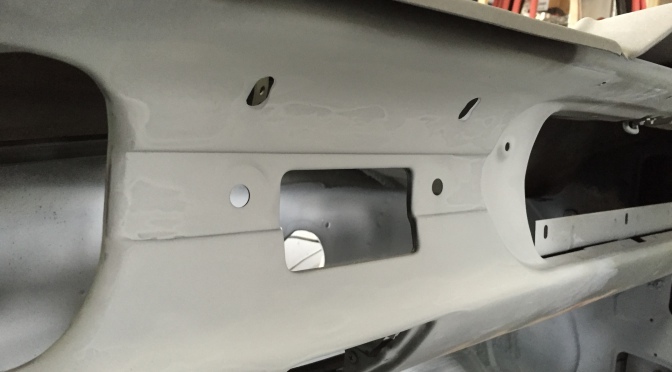 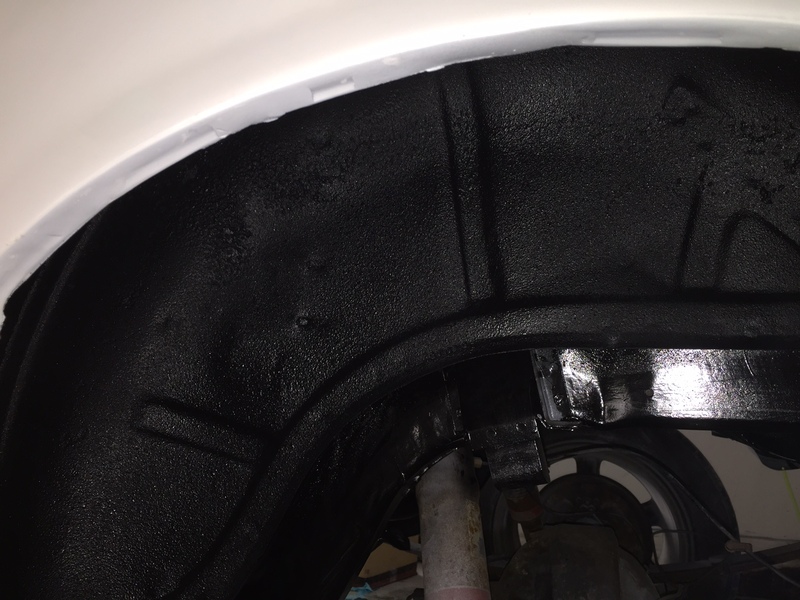 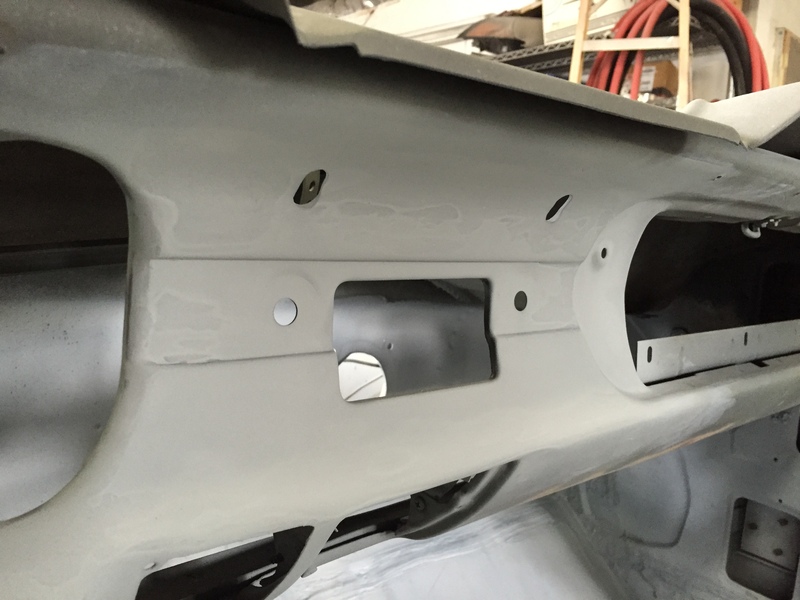 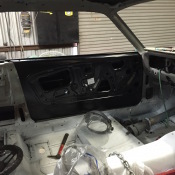 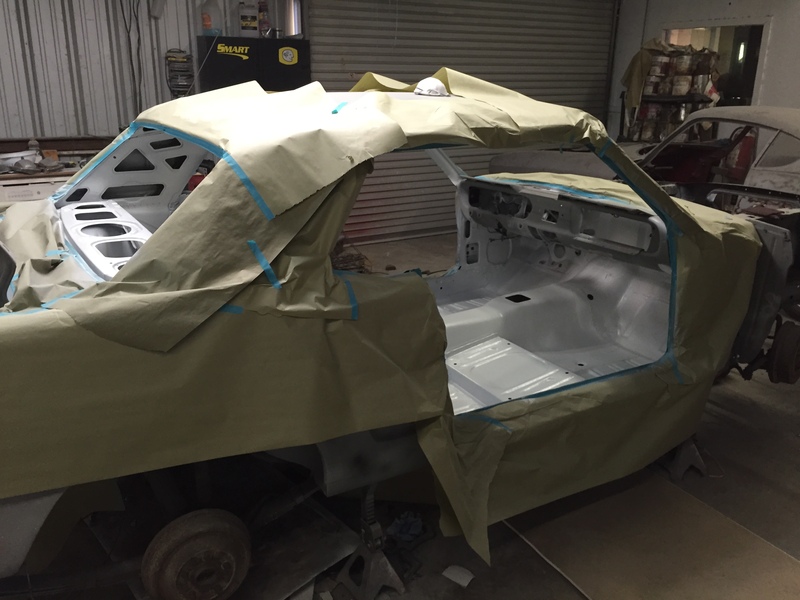 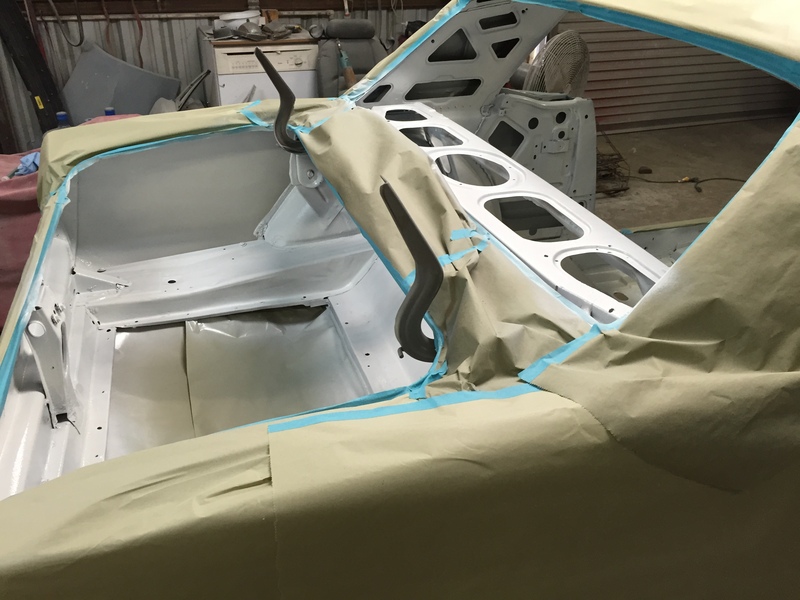 The quarter panel is welded in, and the trunk passenger floor almost complete. 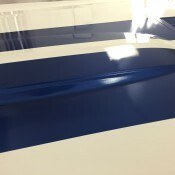 Then only a bit of cleanup on the passenger quarter panel patch. 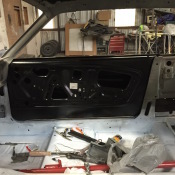 Lastly is repairing the car stereo dash area. 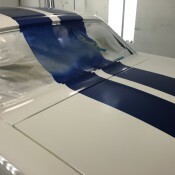 It is starting to look like a car again!